All that brought us back to Day 0. Our flight, that had been scheduled for 6:15 am or so (if I remember right) at the time we purchased our tickets, had been changed to 6:45 am by JetBlue scheduling. As a result, our two hour transfer time in JFK had been reduced to just about an hour and a half. DS had warned us that in JFK, in order to change to our departure gate, we would need to get out of our arrival terminal and go through security once more then find our gate. By the time the morning dawned, like I said, I was in a bit of panic just in case our MCO-JFK flight was axed. Fortunately, we were able to get to the airport by about 3:30 am and check in – the flight was supposedly on time. By the time we reached the gate though, we were informed that there was a 30 minute delay. We managed to all board very quickly and by the time the flight took off, it was only about 20 minutes late. So, though we had over an hour in JFK to get to our gate, we knew we still had to hurry! The plane took nearly half an hour to taxi and get to the gate (thank you JFK!!). Now I was getting close to hitting the panic button. But I stayed calm, and managed to catch up with the rest of the family by the time they reached the inter-terminal shuttle. We got on the shuttle, got off at the terminal, breezed through security thankfully (MCO would have probably taken at least 45 minutes; we are used to MCO and so I was shocked to learn from my Bay Area friends that SFO security typically clears in less than 15 minutes) … and – boarding cards in hand – landed up at the gate and were among the last folks in the queue to board. Yes, our flight was almost all boarded when we got there. At that point, Roadblock!! Apparently, the boarding passes given by JetBlue in MCO – all the way through to JNB – were no good. We had to get over to a different line (which was empty at this point!) to get fresh boarding passes from Qatar Airlines staff. As we were the only ones in the queue, I thought it would be a quick thing – but it wasn’t! Three weeks before departure, DS had informed us that even if both parents were travelling with minors, South Africa requires birth certificates that display the names of the parents (what a dumb rule, I thought, and why hadn’t I been told about it sometime during the ticket purchase process). After double checking with another family that had recently returned from South Africa, I realized that the rule was very valid and after further thinking, I realized that the rule actually makes sense. Now, the Qatar Airlines staff did ask us to furnish the birth certificates – as I had them stuck deep inside my carryon bag, this took a couple of extra minutes. But finally, we were ready to board, fresh boarding passes in hand. We were now literally the last to board the plane as all of those few folks who were behind us in the queue had now managed to board. South Africa, here we come!! Here are some photos of the JFK-DOH leg (photo credit: DS). Transiting from Qatar Airways to Qatar Airways would be a breeze, we thought, so we were not unduly worried that our flight took a few minutes to get to the gate (nowhere close to how much time it had taken for JetBlue at JFK); once in the terminal, I saw that we had to go to Terminal E (I might have gotten these letters wrong but anyway) and we were in Terminal B. I saw a shuttle that was on a higher level than where we were. So, we went up the escalator and got in the shuttle. It went to Terminal C (or so I thought I heard the announcer say – I was too busy taking a video of the shuttle). We waited inside the shuttle for it to go forward even as I – from the corner of my eye – saw most passengers getting off and I also caught a security guy outside yelling something. Next thing I know, he’s literally facepalming, the doors close, and the shuttle reverses. Uh oh! Now we know what’s going on – the shuttle is a very short one, and we didn’t even need to get on it. We could’ve just walked. Anyway, now that we’d wasted enough time, we decided to stay on yo-yo right back to the other station. I see the security dude again, and we each laughed! From here, it was just a short walk down the stairs and around some shops to get to our gate even though it was deceptively described as a whole different terminal. Guess what, this flight was about to board as well, so we quickly got in the line. Once the flight got off the ground sometime around 7 am (JNB ETA was 3:40 pm), I was looking forward to what would be a nice flight through Africa and that I might even get to see Kili from the air. As we would be flying almost due south (first time ever that I had been on a nearly north-south flight along more or less the same time zone throughout), there would be no jet lag at all. Guess again, buddy! The flight took off north of the airport and turned northeast. With me sitting on the right side of the plane, I bore the brunt of the sun’s rays. Each minute, I was expectantly looking forward for the flight to make a sharp turn towards the southwest; didn’t happen. The plane did take a more easterly orientation, but all I could see was a lot of water below, and desert far to my right. The scenery couldn’t have been more boring. After a while, it was obvious to me that we were not going to be heading south over land. And I was right; we kept going over the seas past the Arab peninsula then headed south. Even though I had heard and read about the spat between Qatar and the other Gulf states, I hadn’t considered that the other countries would be spiteful enough to not let Qatar Airlines flights over their airspace, but that’s obviously what was happening (as I later deduced). While in flight, I kept thinking that maybe it is some Great Circle Route that I had not realized. Unfortunately, what that meant was that the window seat was not going to be an advantage for the next few hours for sure. I sat back, relaxed and turned my attention to the entertainment options. After a few hours (just past noon local time, to be precise), I was looking at our progress on the map and realized that we were finally nearing the African coastline and would likely enter the continent. Sure enough, we passed over the island of Zanzibar. Until we passed Lake Malawi, we had mostly cloudy skies like this one. But then, it got better and I was able to get photos of rivers with and without water, mountains, valleys, lakes (per my interpretation of course), and really weird land shapes, especially as we got closer to Johannesburg. Not the most encouraging of signs to see as soon as you land in a new country! Once we got out of the plane, the immigration and customs formalities were very quick – and yes, we did need to furnish the birth certificates upon arrival. Fortunately, I got WiFi in the airport rightaway, so while we were waiting for our bag (we had only one check in bag and one carry on apiece), I was able to contact our host and inform her of our arrival. She replied immediately and said that she was waiting right outside for us. So, within minutes of receiving our bag (with one wheel – of two – missing!! 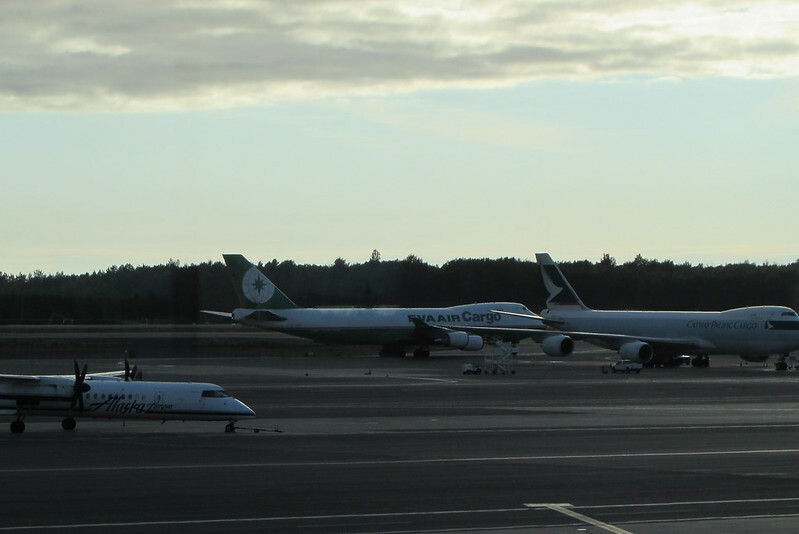 ), we were walking out of the airport across to the parking lot. After getting our bags stowed in the trunk, we were ready to ride out into the sunset … and beyond – to Rustenburg. Though I was not too tired, I was very thankful that our host was picking us up as that left me free to ask questions about the country and the area, as well as take photos of the traffic – and the sunset of course! Hadn’t realized that the freeway would be this wide!! 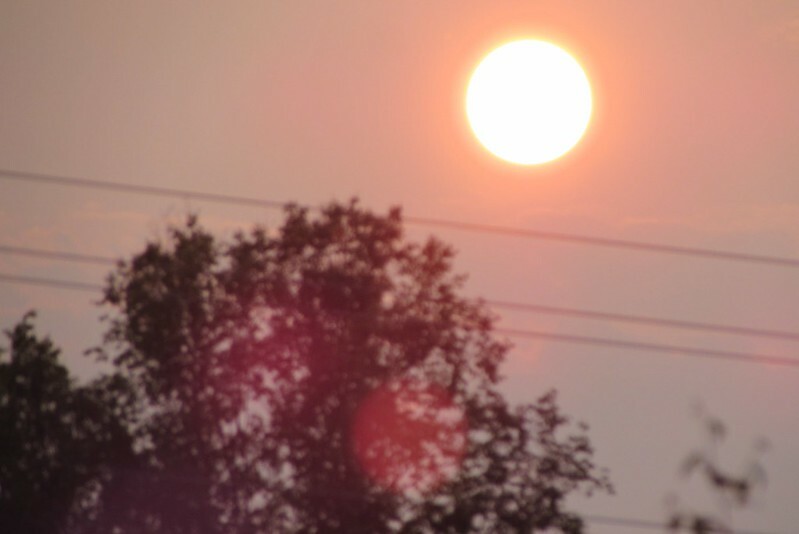 A few sunset photos now – nature photos are always my favourite! Long long ago, in school, we had learned of the Continent of Africa – the sobriquet was ‘andh mahaadviip’ or Blind/Dark Continent. Among other countries on other continents, I had studied about the countries of Congo, Ghana and Nigeria. But though I had had urges of travelling to, say, Argentina and Brazil, I had not really thought that I might ever want to visit Africa. In those days, due to the apartheid policies, an Indian passport holder wasn’t permitted to visit South Africa (the restriction was on the passport; I don’t know if South Africa ever cared about it). So, even if I were to visit Africa, it would have to be one of the other countries. Anyway, apartheid is a thing of the past (no such restrictions exist anymore on an Indian passport) and now I live in the USA, which makes it relatively easy to travel to many countries without a visa. But still, I’ve always felt that there are many other places and countries I would want to visit before setting foot on the continent of Africa. Then, a couple of years ago, some of our friends in the same subdivision made a trip to South Africa. After looking at their photos, I commented about how while those photos were really nice, Africa would not be in my radar for the near future. At the start of this year, though, something happened that changed all that. It was during the South African summer of 2017-2018 that the Indian cricket team visited for a test series. Having purchased an annual cricket subscription via Sling/Willow, I was following the tour and watching some of the matches as time permitted. When the cameras panned outside the grounds and then South African tourism commercials were shown, I suddenly started to get butterflies in my stomach and a desire to visit South Africa was born. We were up at 2:45 am, anxiously reviewing the status of our six am flight from MCO-JFK. Yesterday’s flight had been cancelled because of thunderstorm delays the previous evening (go figure!! ), and as there had been thunderstorms and delays last night as well, we were really worried (correction – I was really worried). So worried I had been that yesterday, I had whatsapped our airbnb host in Rustenburg asking if we could think of a plan B (no dice, as they were pretty much booked solid the next week) in case our tenuous connections – just under two hours in JKF to change terminals and get past security (and something I hadn’t even considered, get a fresh set of boarding passes) and then just over an hour in Doha (thanks, Qatar Airlines). Anyway, I was afraid I had placed myself firmly under the eight ball, what with my quest for el cheapo airfares that turned out to be anything but! Anyway, let’s start at how it all got started. In December 2016, I was going to India to attend my wife’s niece’s Big Fat Indian Wedding (to be honest, I was one of the few who really met the conditions for that adjective, but that’s besides the point). On an MCO-FRA flight, I got into a conversation with my seatmate – an employee of one of the plethora of cruiselines in Florida, he was off to his homeland for a well-earned vacation. And his homeland? Botswana. I learned that when I changed to a Mumbai flight in Frankfurt, he would get on his connection to Johannesburg enroute to Gabarone. I wondered: what on earth would he do in Botswana other than visiting his family? Not only could I answer the question then (Only now has the Africa-returned me finally got the answer), but I also wondered why anyone else would want to visit Gabarone (or even Africa for that matter)! Africa had always been a mysterious place for me – I had studied about countries in Africa in middle and high school geography classes mostly (with some history thrown in), and the moniker of Dark Continent fit perfectly. Four years ago, I had sung along to ‘waka waka’ with Shakira and her troupe, and watched the World Cup Football matches on TV but that hadn’t kindled any desire to visit an isolated land mass, bearing lots of diseases especially the ones the flummox mankind and modern doctors – it was the last continent I would ever wish to visit (maybe even after Antarctica). Or so I thought. Well then, what happened that made me do the about turn? Well, in December 2017, I purchase an annual cricket package online from Willow TV. Cricket is a game played by many countries in the world, but obviously it is more popular in the erstwhile colonies of UK than elsewhere. So in the early months of 2018, the Indian cricket team was touring South Africa, and I was tuned in on the TV. The more I watched, the more I wanted to visit South Africa. By the time the series ended, I was ready to jump out and head over if I found a good ticket price. As I’m subscribed to a bunch of flight price notification websites, you would understand that it didn’t take long for the prey to be caught! Specifically, one day in January (or maybe February, I don’t remember which it was), I came across this email that touted flights to Johannesburg – even from Orlando – for less than $1,000 … with a catch! The tickets on Qatar Airways were open jaw itineraries, and we were on our own as far as getting back home was concerned. Not to worry I thought, we had enough of a cushion between the advertised price and (big mistake) what I thought the typical good-deal round-trip airfare to Johannesburg was –> $1,300 to $1,500 [[i]I have since learned that tickets can be had in the range of $1,000 to $1,100]. If we didn’t get a good ticket price from the Europe destination of the original ticket, I gave ourselves two days to get to a different European city from where we could take a flight back to Orlando. In other words, if we were landing in Open Jaw Destination city on day 1, we should be looking at landing in Orlando on day 4. We were severely constrained on this end, because classes were starting the Monday following, and family wanted to be here on Friday. Which meant, we had to make Thursday our “day 4” and Monday would be our “day 1”. With that in mind, I scouted through the gamut of available destination options in Europe and, in my infinite wisdom, I picked Sofia, Bulgaria for our Open Jaw Destination. Why? Don’t even ask, OK?!! We were constrained with regard to our departure date as well, but after a lot of brainstorming, we finally decided that we would leave two weeks and two days before our return date, i.e., on a Tuesday … assuming our stars lined up and I was able to get the tickets for that itinerary. Which I did, without much difficulty – except for the short connections, which I glossed over, as I thought that a morning flight should pose no issues (we’ve missed connections because of weather multiple times before – the last having happened just last summer – but they were all on evening flights) within the USA, and there should not be any issues in Doha, it being a Qatar hub and a Qatar-to-Qatar connection. So now, we were armed with an open jaw itinerary MCO-JFK-DOH-JNB-DOH-SOF. At this point, we were left with figuring out the itinerary within South Africa and our return trip. At this point, there was a mutiny in the house. 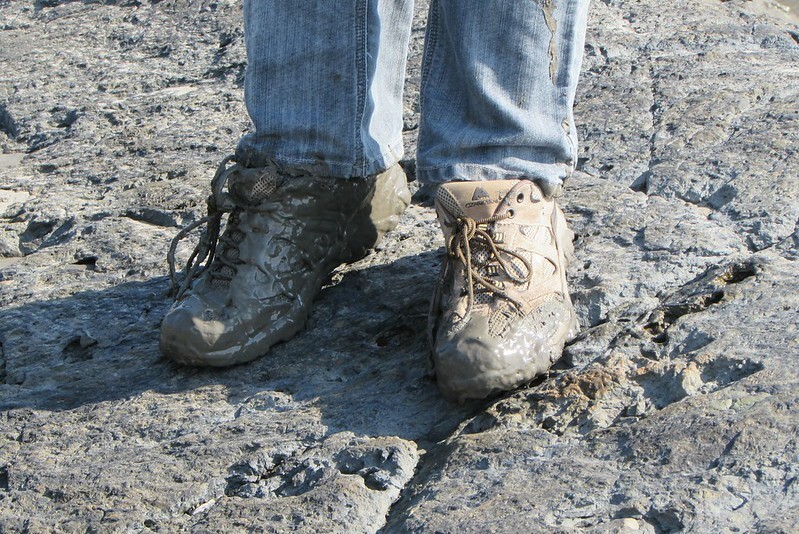 DW and DS – with tacit approval from DD – had arrived at the conclusion that I turn into a slavedriver on pleasure trips, making everyone wake up early to use the maximum extent of vacation time [[i]guilty as charged, if I may add ;-)]. But they didn’t want to be running around; rather, they wanted to take it easy (or at least, easier). So, I had to reluctantly hand over the reins to them. As a result – and this was to my own disadvantage – I neglected to perform any research and planning. First thing that they determined was that Kruger was going to be quite a reach. Instead they preferred a place closer to Johannesburg and found Pilanesberg National Park. To be honest, I had also been wondering if we could pull off Kruger, while also having time to visit the other destinations we wished to visit. But I had been looking at Madikwe based on – I vaguely recall (so might be wrong) – someone’s trip report in this forum. So, was not too overly worried about missing out on Kruger. In theory, I was fine with all of that except that – I was worried that if we got up late on any of those days, we would be missing out on sightseeing, especially as it was winter in those areas and sunset was in the 6:30 pm range more or less. And I didn’t think we could afford to take it easy in getting ready once we got up either! I was not too keen on the Garden Route and would have preferred doing it a bit less leisurely and instead spend some time at Addo National Park; I wanted to take a train within South Africa JNB-CPT (either direction) and I wanted to take the overnight train from Bulawayo to Victoria Falls. But anyway, I didn’t want to get in the way of the plans that DW and DS had come up with, so I gave in to the plan. After all, for the most part, it was just me quibbling for a train instead of a bus and a couple of hours here or there. For the three days in JNB area, we would rent a car as soon as we got out of customs and immigration, then drive to Mogwase, which is a small town south east of Pilanesberg National Park and just outside the park boundaries. Here we would stay at a Bed & Breakfast. In CPT, we would get an Airbnb very close to Table Mountain and the CBD area. Upon landing from JNB, we would rent one car for local driving for three days, then drive back to the airport and swap it (not literally) for a one-way rental for two days which we would drop off at Port Elizabeth. On the way, we planned to overnight (Airbnb again) at Hermanus and Knysna. Then a night in the airport – our departure to BUQ was at six am, and we didn’t see the wisdom (now we do!!) of getting accommodation to sleep until 3 am then get quickly ready to go to the airport. In the town of Victoria Falls, we got a family room in the backpacker’s lodge accommodation – mainly for the convenience and the proximity to the actual Victoria Falls area (needless to say, it helped our budget too!). Of all these plans,I was a bit worried about using the Airbnb. Now don’t get me wrong, we’re relatively Power Users of Airbnb; however, with the stories we had been hearing of security in South Africa, I was not too keen on Airbnbing – I was wanting to stay at a proper hotel. But then, once I started reading the Airbnb descriptions of the kind of accommodations and hosts available, I got over that feeling of insecurity. Besides, the media always reports the scarier/bad news, is how we sort of rationalized our decision. After some more research on Airbnb, I was able to find what appeared to be a very nice place in Rustenburg, which is halfway to Pilanesberg from Johannesburg. Not only was this place less expensive than the Mogwase Bed and Breakfast, but the host also offered pick-up and drop-off from either of the local airports, as well as provide a day trip into the National Park. All for an extra fee. After asking for a quote, we decided that it might be the best of all worlds for us; we wouldn’t have to a) rent a car b) drive in a tired state of mind c) figure out how and where to self-drive in the park d) pay top dollar (or Rand) to a professionally guided safari (as our host should be able to give us some insights into the area). A bit surprisingly, both DS and DW agreed with my decision and so, we cancelled the Mogwase accommodation and signed up for Rustenburg. With that decision made, I realized that in Jo’burg, we wouldn’t really be going anywhere on our own – and I liked that, because this city is where I had been most scared about from a security standpoint. What it also meant, though, was that we wouldn’t be able to check out the most touristy aspects of the town, as we would be in Rustenburg except for the drive in and out of JNB airport. For Cape Town, our primary factor was distance from the CBD and Table Mountain which we intended to hike up. In Hermanus and Knysna, the Airbnb decisions that we made were just based on the photos and the budget that we wanted to stay under. 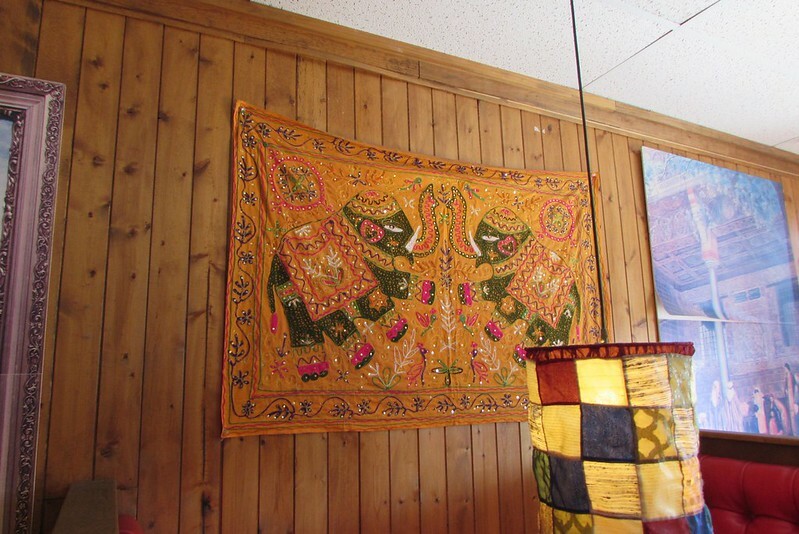 Both places had a range of available places, some less expensive, and others more expensive. DS then figured out which car rentals to get, and I paid for one online – the second one we needed to pay at pickup. On our last day in Alaska on this trip, we woke up at leisure. There was no need for us to hurry, as the flight out was past 9 pm. 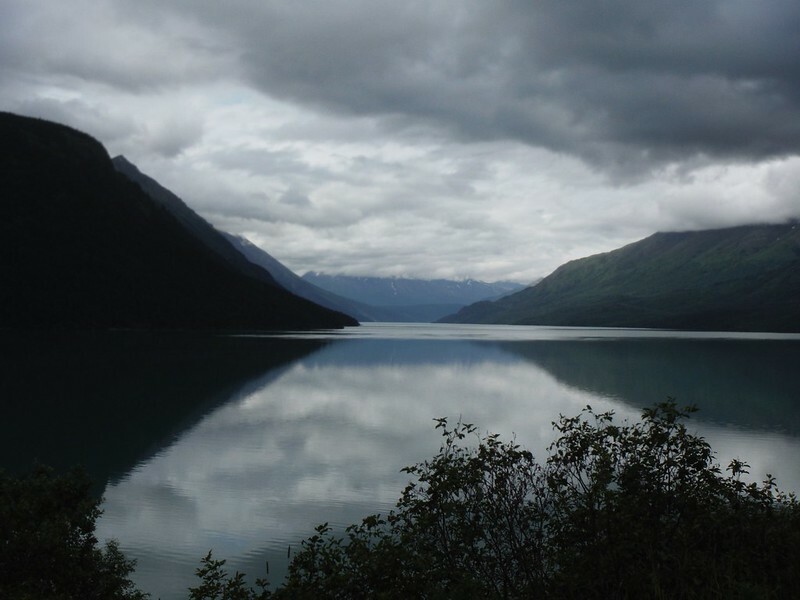 However, I did want to see if I could catch the reflection of the local mountains at a glassy lake at the point where Sterling Hwy forks off of Seward Hwy. 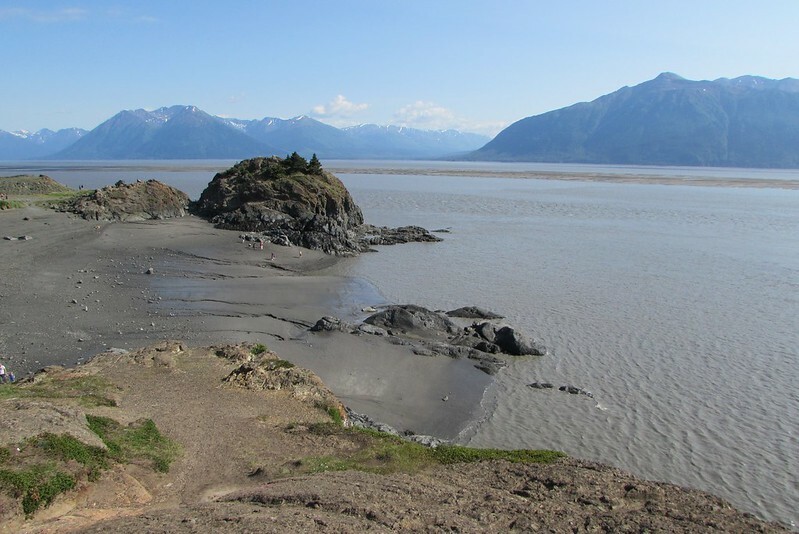 Based on the couple of times we had driven by that area, I noticed that the glassiness was at its peak early in the morning (previously, we had wanted to get to Seward asap and so had not stopped for photos). Unfortunately, this morning we were too tardy. By the time we got to the spot, the glassiness had all disappeared. We did stop nevertheless and took a couple of photos. We then took a left turn and rejoined the Seward Hwy back towards Anchorage. The weather was still pretty nice and sunny though there were some clouds in the sky. Soon, we came upon the spot on the highway where there is a downward incline and the road curves to the right. At this point, there is a Kenai Peninsula welcome sign. Sure enough, we stopped here to get a few photos. 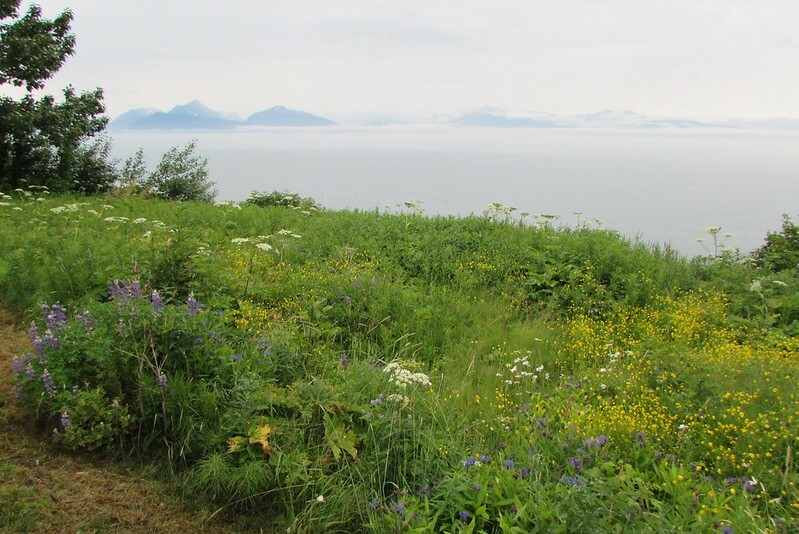 In fact, we took a fair number of photos with different combinations of family members 🙂 As I was posing for a photo, from my peripheral vision, I noticed a lady bike (on a cycle) past us towards Anchorage going downhill. When I was about to turn from subject to photographer, I noticed that she (and her bike) were on the ground just off the road, with the bike wheel overhanging over the highway. I ambled/jogged (“ran” would be an exaggeration!) over towards her asking if she was OK. At this point, she had sat up and was looking quite dazed as far as I could tell (me being on the opposite end of the highway). As I saw a pickup truck (or was it a van?) approaching along her lane of traffic, I managed to flag it down. A couple came out from it, and I briefly told them about the biker lady. They quickly took over and together, we flagged down vehicles in both directions and made it a one-way traffic zone. Fortunately, though the queue was building up in both ends, drivers were patient … and the queues didn’t get too unwieldy. I didn’t get closer to the biker, but they appeared to determine that she had probably gotten a concussion or something, so were gingerly helping her maintain her sitting position. After a few minutes, a police vehicle also came to the area, and at this point, I returned to where we had parked our car near the welcome sign. Mrs. Porcupyn had apparently wondered where I was for a couple of minutes before realizing that I was out on the road! Anyway, before the traffic got unmanageable, we got into our car and managed to take advantage of a break in traffic to ease into our lane and continue with our journey. 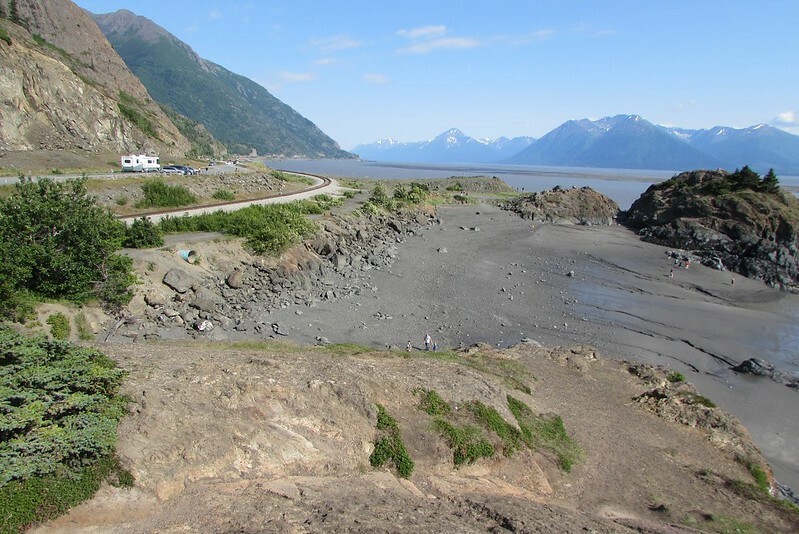 In a few minutes, we came to the point where the Portage Glacier Road joins Seward Highway, and I got out of the car to take some photos. This was the start of the weekend and folks were all out in full force enjoying the beauty of nature. But guess what? By the time I walked back to the car after getting my photos, I noticed that a lady biker was down here as well! Some of the others who were there either biking or jogging were helping her get back to her feet (and bike) – she didn’t appear in as bad a shape as the other lady had been. 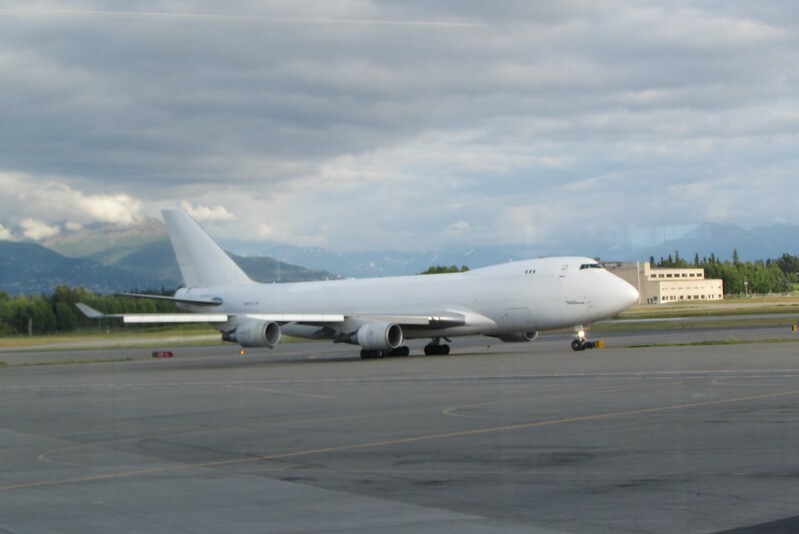 We then continued our journey back to Anchorage. At about five pm, we were supposed to be meeting Mrs. Porcupyn’s second (or is it third?) cousin who lives in the Anchorage area. By the time we made out customary halt for water 🙂 and got back to town, it was about three pm. We still had a couple of hours to kill. Baab and I left Mrs. Porcupyn, Katya and my mother at the local mall and drove over to take photos of the flights landing and taking off. But here I made a big navigational error (and I still don’t remember how I made this error), and I went the opposite direction from where I needed to go. Let me rephrase this: I had known where I wanted to go, but looking at the map right now, I picked out a location on the diametrically opposite side of the airport. So, we did go to the destination I checked on the map, but it was not the correct one I had originally wanted to go. So, we ended up in this state park with tall trees, and though it was bordering the airport, I didn’t see any clearing where we could have seen and taken photos of planes. By the time I realized this and punched in the location we needed to go to, we realized that it would be too late for us to get back to the mall where we had said we would be back to by about 4:30 pm. So, we abandoned the quest for the planes. Next I thought maybe we could at least check out the train station, but that didn’t pan out either as I failed to figure out where it was located (remember, we didn’t have internet service at this time). Finally, we went back to the mall, picked up the rest of the family, and went to meet cousin and her husband. We all then went to a local pizza joint for late lunch/early dinner. By now, it was nearly seven pm and I was starting to get a bit antsy as we had to return the rental car and check in. Fortunately, there was no line at either location and we were in our gate area before 8:00 pm. We killed time strolling around doing window shopping. Baab managed to get a few plane photos (so did I) before it was time to board. After an uneventful journey, we were in Seattle. 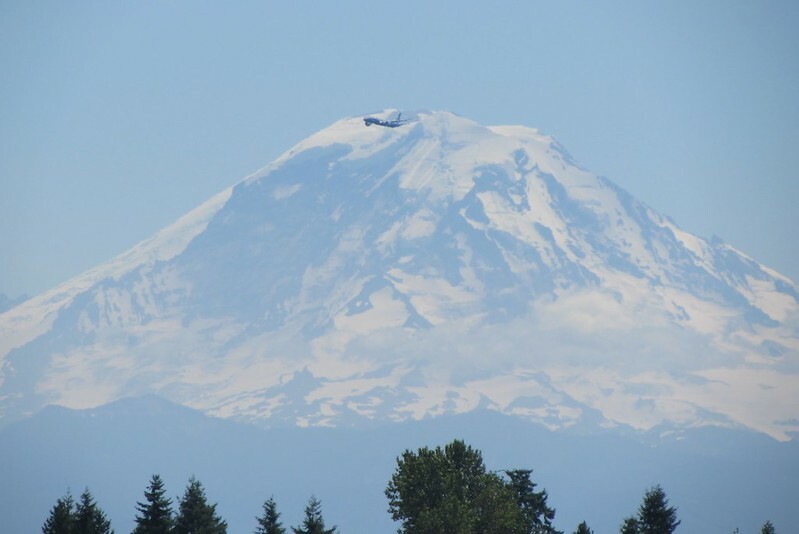 In Seattle, we got the shuttle to our motel; later that morning, we rented a car and went on the Boeing tour which, to be honest, we thought was over-rated. That evening, we had dinner at an old friend’s house. On the way, we got to see Mt. 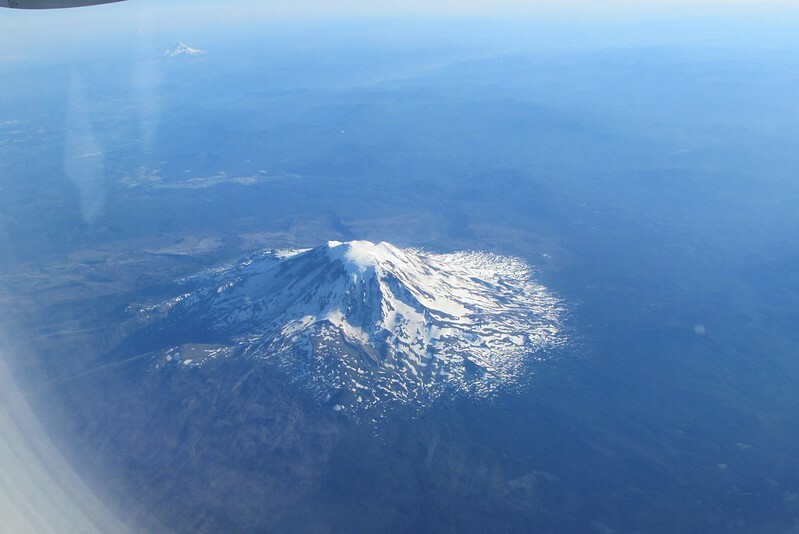 Rainier once more. 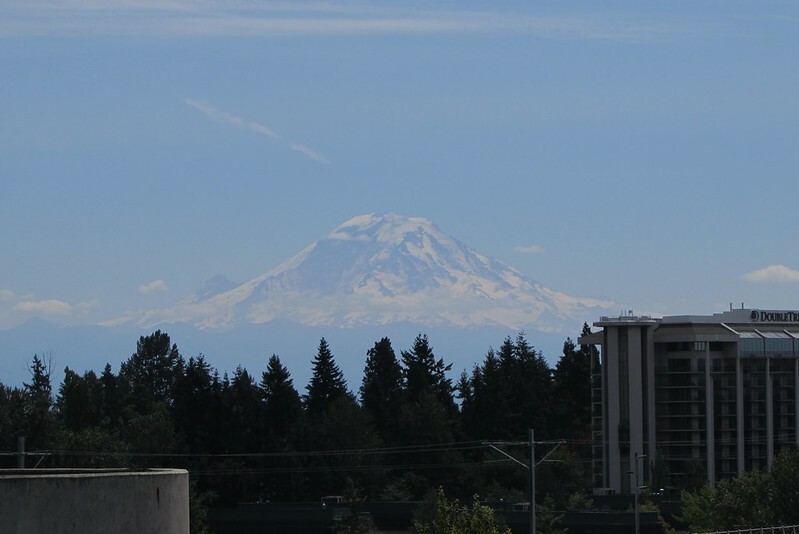 We had great weather in Seattle throughout our time there. The next morning, we returned the car and headed back to the airport. Our flight was at about 6 pm for Salt Lake City, from where we had a red eye into Orlando. 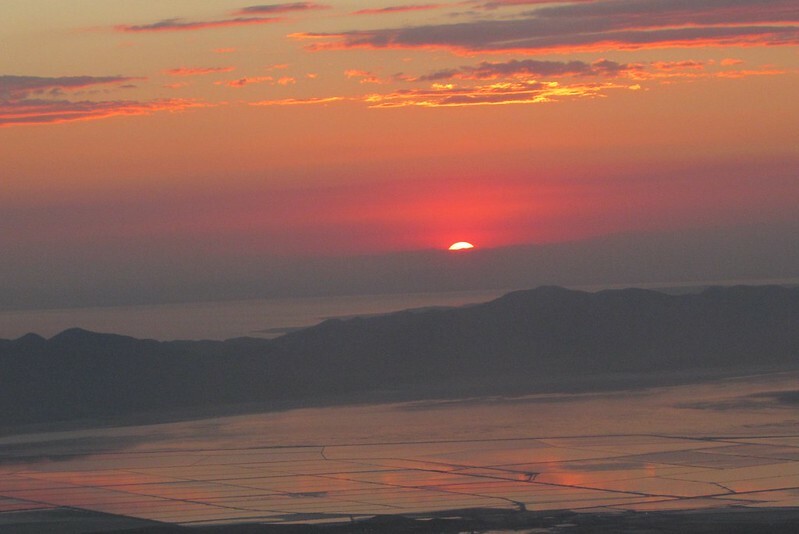 Flying into Salt Lake City right around sunset, we got some great views of the unique scenery presented by the Great Salt Lake. 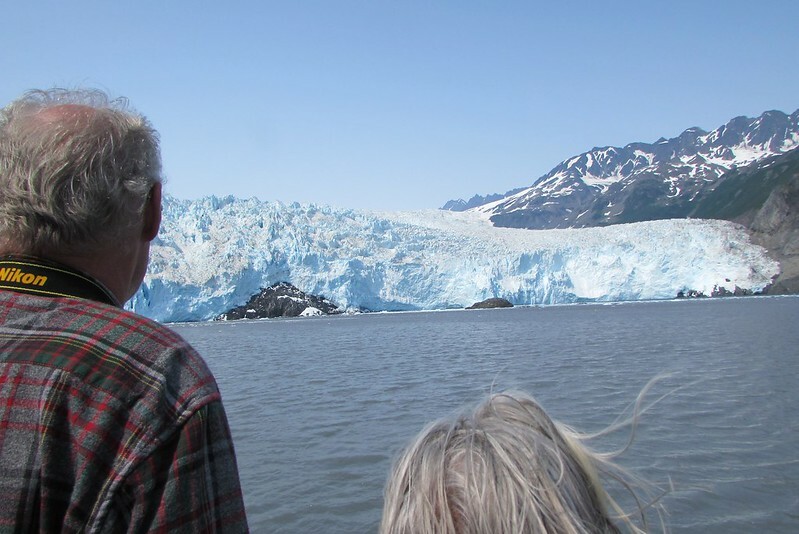 Today, the plan was to leave my mother in the Airbnb and go early in the morning to Seward to view the Exit Glacier. We planned to return at about noon or slight after that, with lunch from Seward. After having lunch, we would then head down Sterling Highway all the way down the other end of the Kenai Peninsula to Homer. It was a bleak day when we set out, after having some bread sandwiches for breakfast, with bluebuerries and coffee. 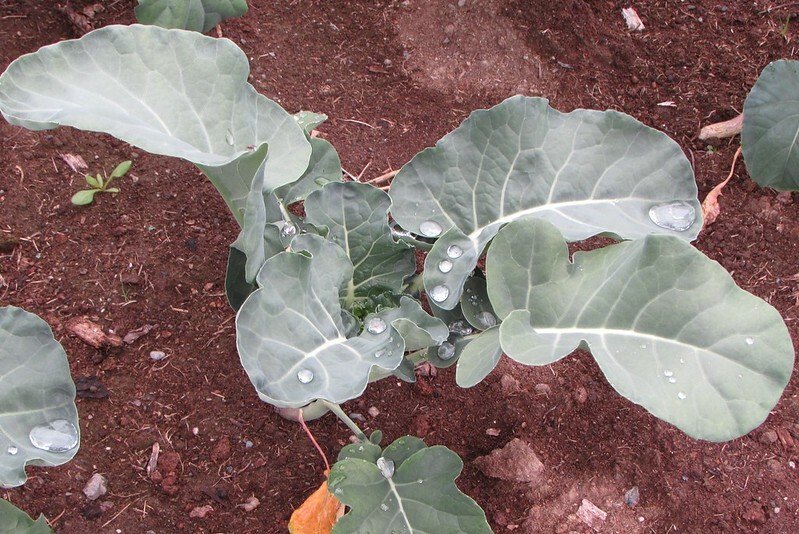 Forecasts called for light rain as well. We were glad that we had not encountered this weather yesterday, when we had our cruise out of Seward in “brochure” weather, as the crew had put it. 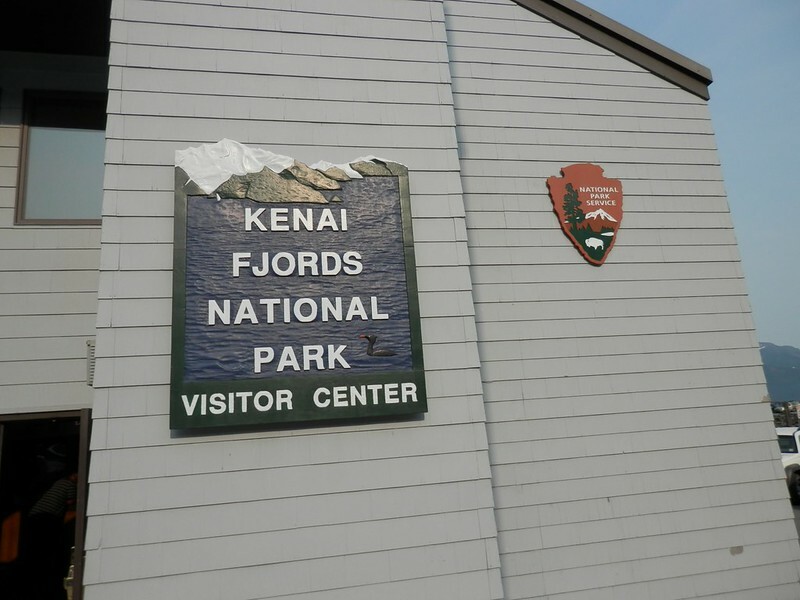 As was the case yesterday, we did not encounter too much traffic or delays related to traffic and were at the Exit Glacier visitor center by about 9:30 am. We waited around for the hike group to form, when we learned that there had been an earlier ranger-led hike that had gone further up the trail. Had we known about it, we would have definitely made an effort to be there earlier; however, it was now too late to catch up to that one. Oh well! Our hike was quite easy. It was quite enlightening to see how far the glacier had retreated in the last century, based on the markers built along the hike trail. But what was really surprising was how much vegetation had built up in the last three-four decades where there used to be just glacier back then! The ranger explained to us the symbiotic relationship between the Alder trees and the Cottonwood trees that dominated the vegetation. After about an hour, we got to the end point of the trail from where we could see the lip (though if you ask me, I would term it to be the ‘tongue’) of the glacier. 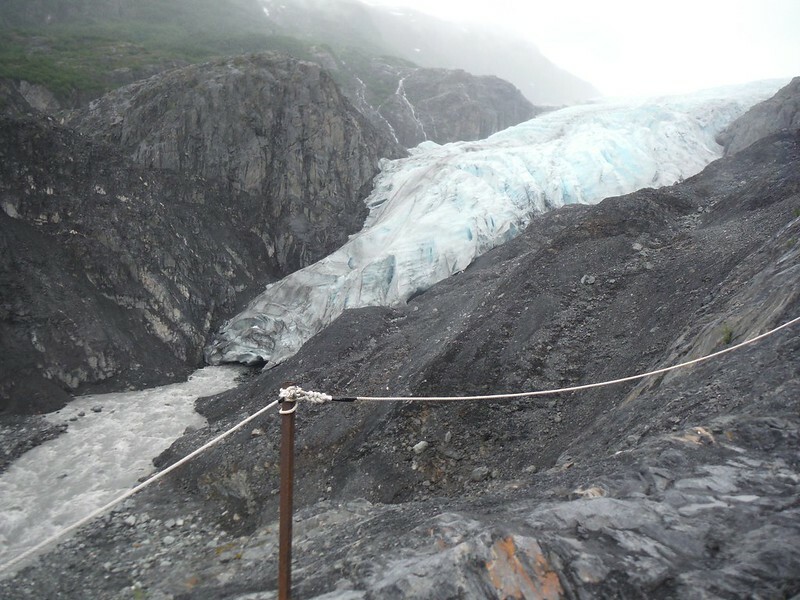 At the Exit Glacier, sections are roped off but the ranger was kinda iffy whether or not folks go past those to get closer to the glacier, At least, while we were there, everyone heeded the signs and no one went past the ropes. He told us that should we want to get closer, we could stay on the trail that led up to Harding Icefield, but being wary of bears as well as being short on time, we decided to head back. On the way back, we first went to Seward and got some sandwiches from Subway as well as some other grocery items such as bread and snacks. Driving back, we saw that the lake (later I found out that it was Kenai Lake) looked really beautiful nestled between the mountains. I stopped the car and tried to see if there was a path to go all the way down to the lake to get a clearer and closer photo; however, there was no clear path and any way to get to the lake was pretty steep. So, I abandoned that thought and got a few photos from the roadside instead. Even with an automatic camera, it is possible to bring out the contrasts in the scenery based on the exposure! … taken one after the other! After coming back to our lodge, we had a quick lunch and left for Homer. 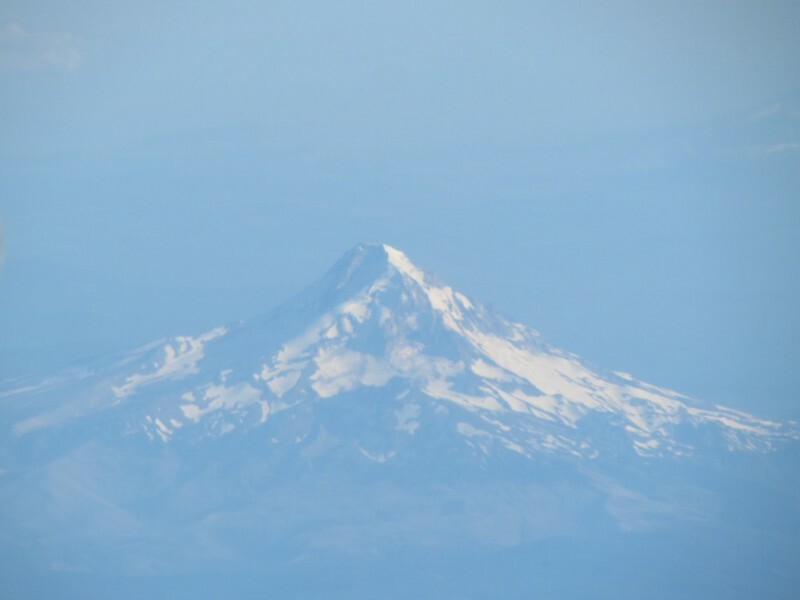 During my initial research, I had remembered reading about a volcanic mountain that would be visible from here, as well as glaciers across the bay. 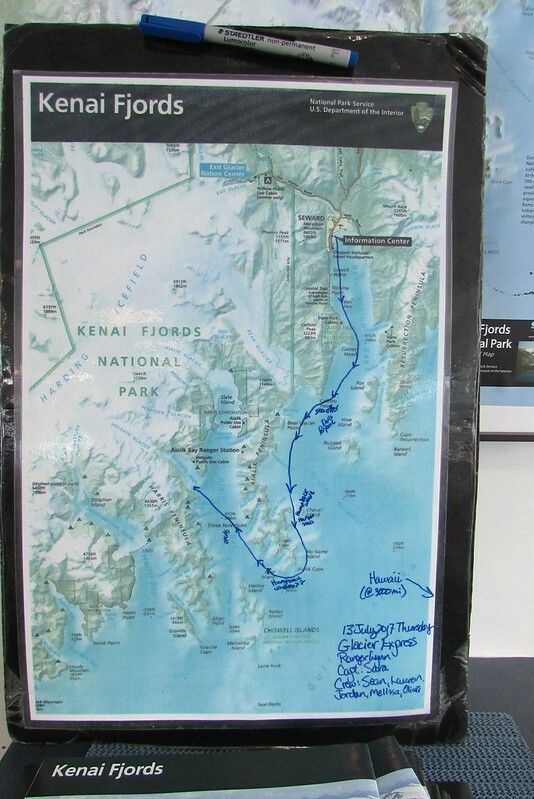 There were also ferries, I had learned, that would take you to a carless location (Soldovia) where you could go on short treks up to glaciers. Of course, though we did not have time to spare to do any of those activities, I wanted to go all the way to Homer, come hell or high water! Thankfully, we encountered neither, though it was drizzling for most of our drive there. On the way, we passed through Sterling (reputed to be a great spot for fishing, an activity that didn’t really excite us … and bears, which definitely did not excite us either! 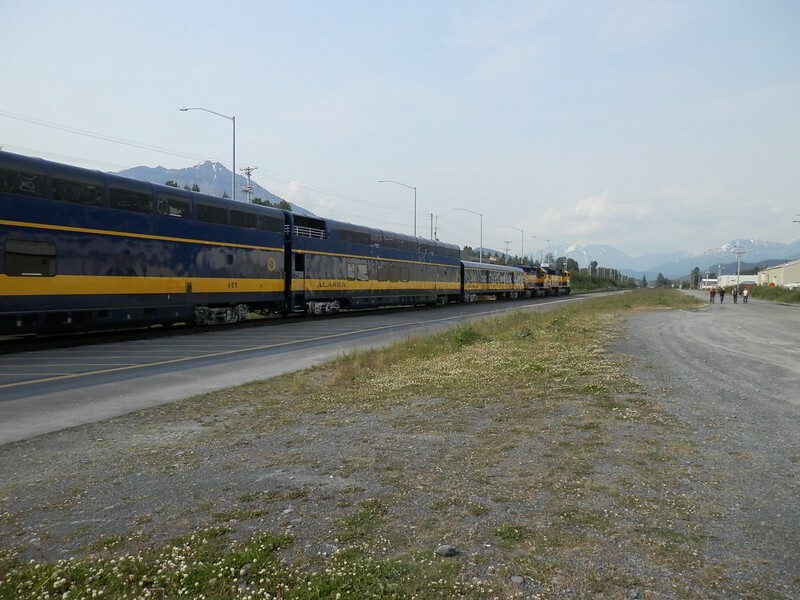 ), Soldotna (this is where I had originally reserved accommodations before realizing that we needed to be at Seward, not Kenai, for our cruise), Kenai River, and many other picturesque locations. 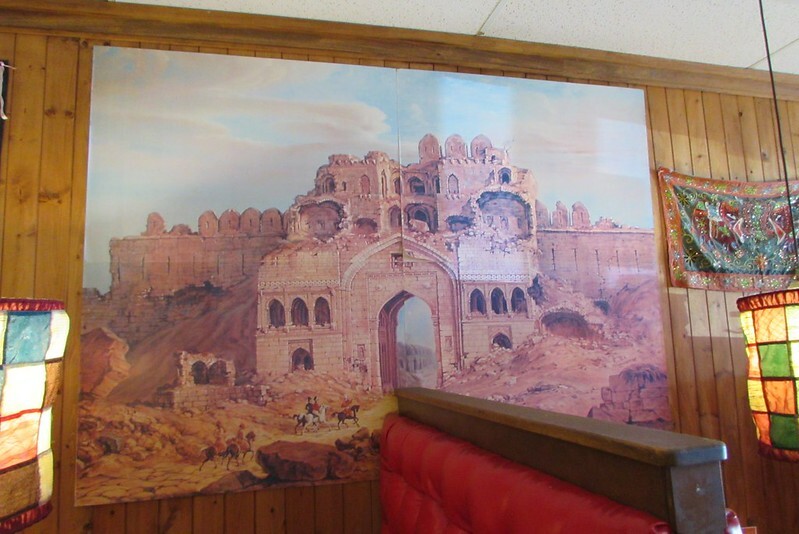 Soldotna surprised us – I had not realized that the town would be as big as it was, especially after having encountered communities such as Whittier, Seward, Moose Pass, etc. 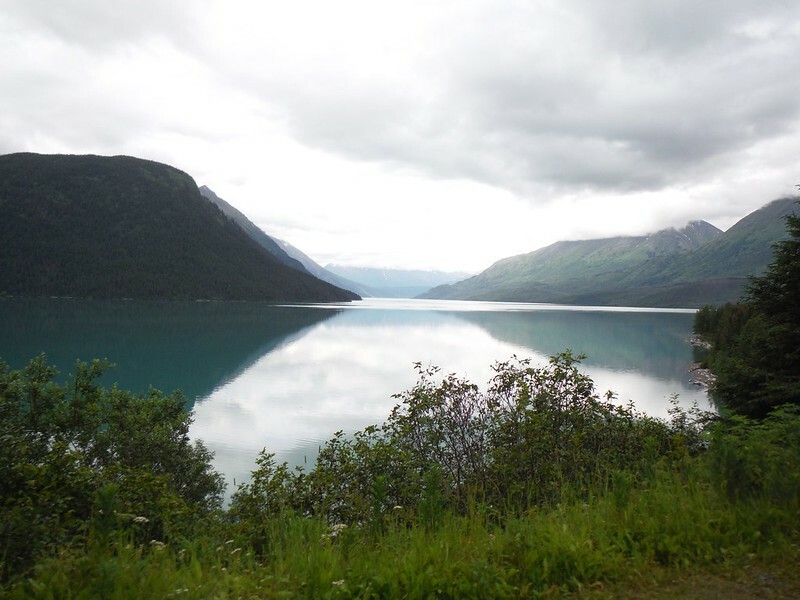 Had I researched this area more and had we had more time to spare, we might have had a separate vacation trip to Soldotna as well, just to laze around and enjoy the sights! However, as it was, we went straight to Homer. By the time we reached Homer however, the fog and drizzle had set in. 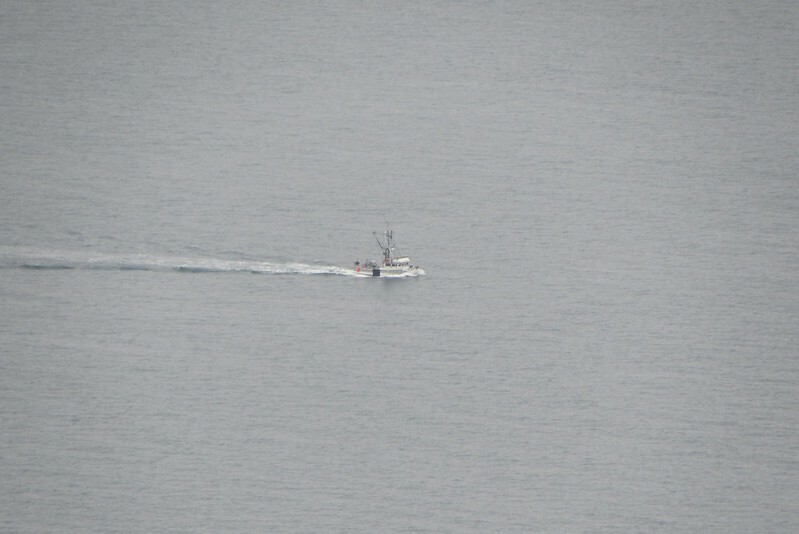 It was difficult to see too far into the Bay. 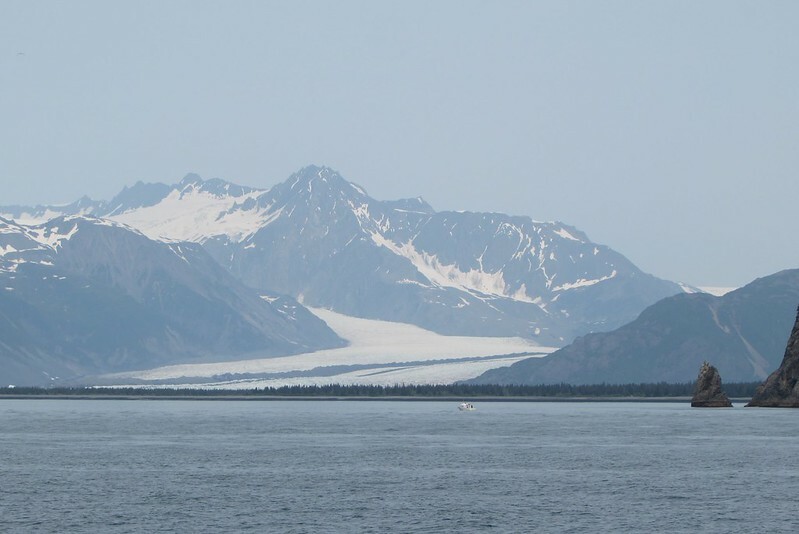 In fact, after we returned and even now, I am unsure whether we were looking towards the volcanic peaks or across the Bay into Kenai Peninsula itself. I would say this was the second worst weather day of our trip (the worst being the day we drove from Palmer to Denali in steady rain all day long), but given that we had already done whatever we wanted to do on the trip, I was not too miffed. 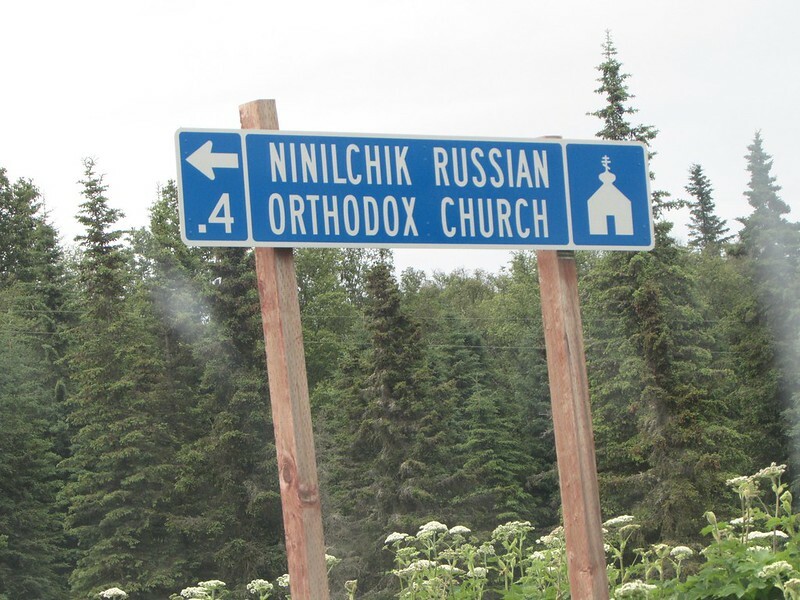 Though we never could really see Russia from anywhere on Alaska however much we craned our necks ;-), we did pass by this community that apparently still follows Russian traditions and some of them even speak Russian! Traffic was pretty heavy that evening as the weekend was just getting underway (it was a Friday). We saw a lots of platoons of cars headed towards Homer. We were glad that we didn’t have a lot of traffic in our direction and reached the lodge after an uneventful drive. 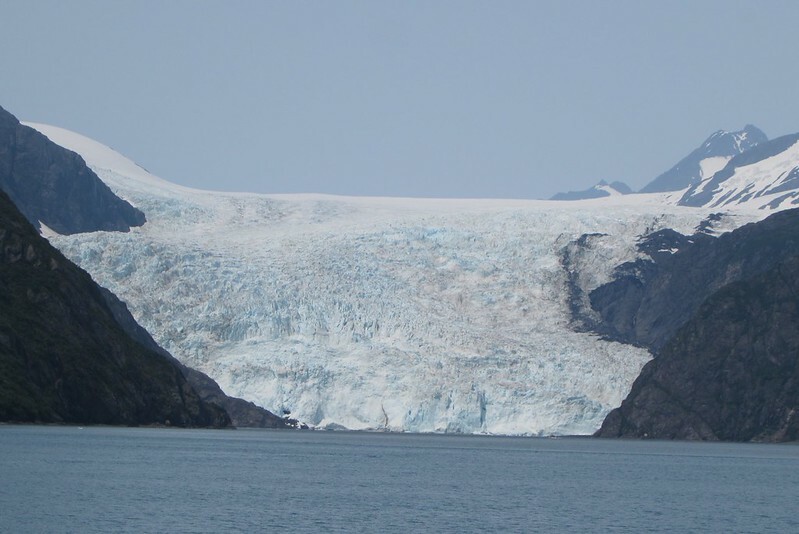 The two day cruises we had taken from Whittier had both departed right after noon; the reporting time had been after 11 am. However, the cruise that we were signed up for out of Seward was leaving at 10 am and the reporting time was just after 9 am, so we had to hurry up to get there in time. If we left at about 7:30 am, we thought it would be sufficient for us to get there in time. The day before though, we ran into our elderly neighbour at the Airbnb, who said that it would take about two hours and likely even more if there were to be traffic and/or accidents. We would also need to wait for a tunnel. He kindly offered to give us a newspaper that had detailed information. Listening to him, I was confused. 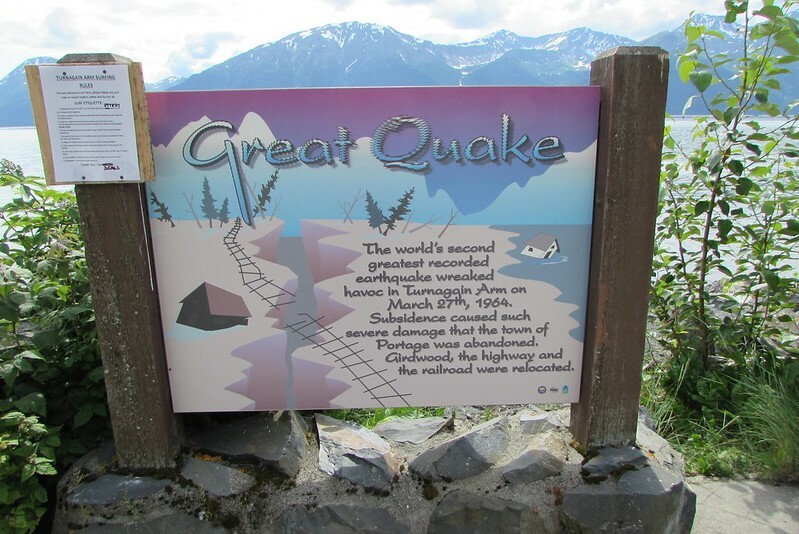 I didn’t recall reading anything about a tunnel to Seward – but as he obviously had visited in the recent past, I thought maybe I had missed something. To be on the safe side, I decided to talk about it with our host. He confirmed that there was no tunnel and that if we left at 7:30 am, it should not be an issue, unless there was an accident somewhere! 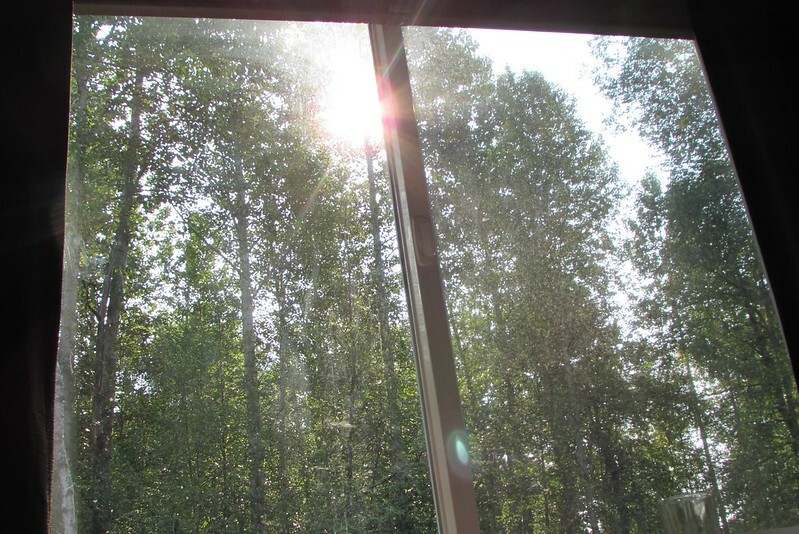 I decided that the neighbour must have – for whatever reason – mixed up Seward and Whittier! Because we had to wake up really early, though the accommodation was comfortable, we had a fitful sleep. Besides, I was hoping for good weather and smooth seas. As it turned out, our day couldn’t have been much better. We woke up at about 6 am to a sunny day, quickly got ready with butter and jam sandwiches for lunch and left on time. 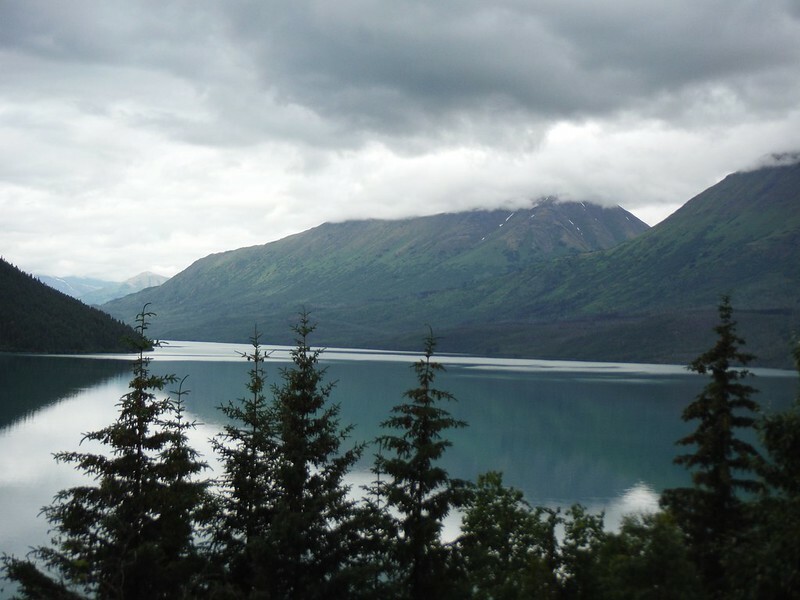 The route to Seward is quite scenic with mountains on both sides and for the most part of the route, we had Kenai Lake to our right (though I didn’t realize it was one lake until I looked closely at the map upon returning!). 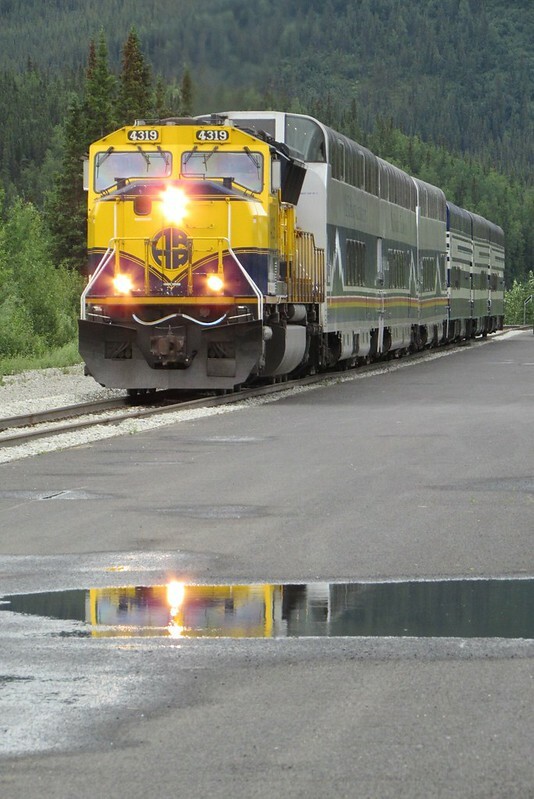 We passed through the little town of Moose Pass along the way – this had been one of the places to stay that I had researched, but hadn’t found anything decent that fit our budget. 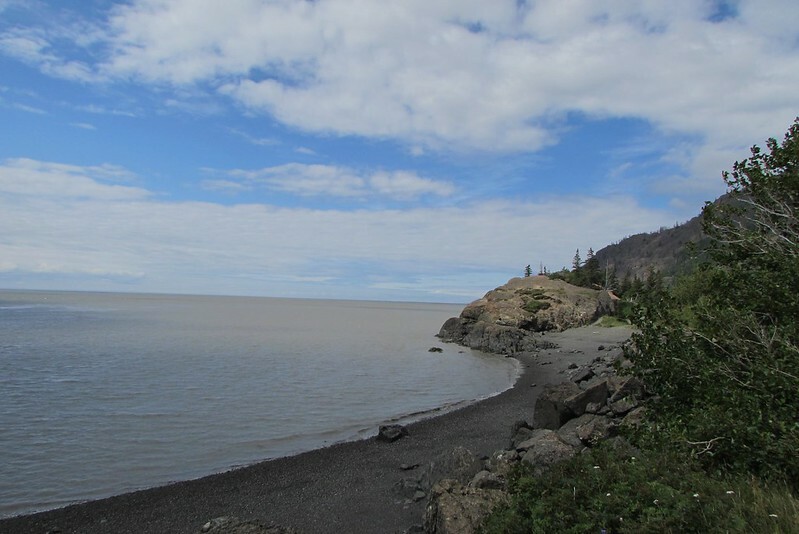 Though it is much closer to Seward, I was thankful we didn’t pick it as it didn’t appear that there was much to the town (I am sure folks who have stayed there might have better information of things to do!). 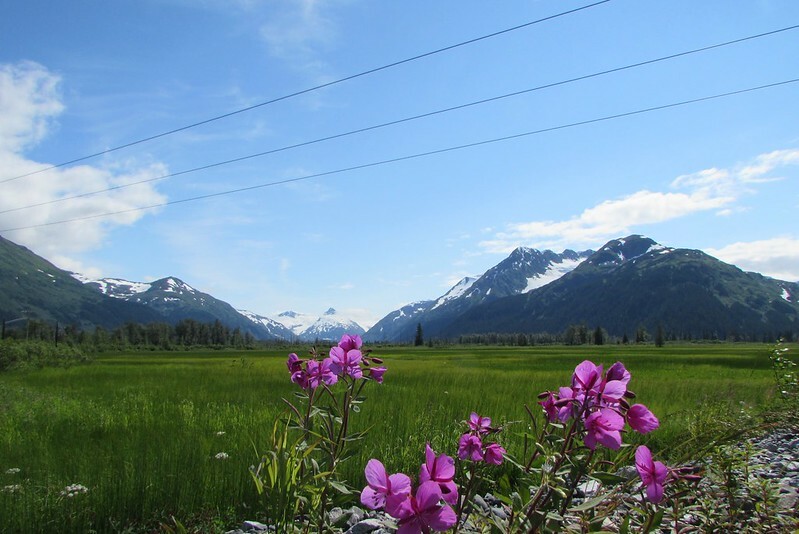 As we started to see the outskirts of Seward, I realized that we were well ahead of schedule. It was about 8:15 am, so when I saw the road sign to Exit Glacier, I decided to take that fork. I thought that if we went about 15 minutes and didn’t get to the end of the road, we would turn right around. It was less than 15 minutes when we could see the glacier from the road itself. So, we decided to go all the way and take a couple of photos. But once we got closer and parked at the entrance parking lot, we found that we could no longer see the glacier among the mountain and the trees. So, we made the best of the visit by checking out the visitor center and using the restrooms. We then retraced our path back into Seward, which was impressively bigger than Whittier (and we never did go all the way to the end of Seward). We were impressed, too, that it had a Subway, a Safeway and many restaurants as well, should we need food later in the evening. 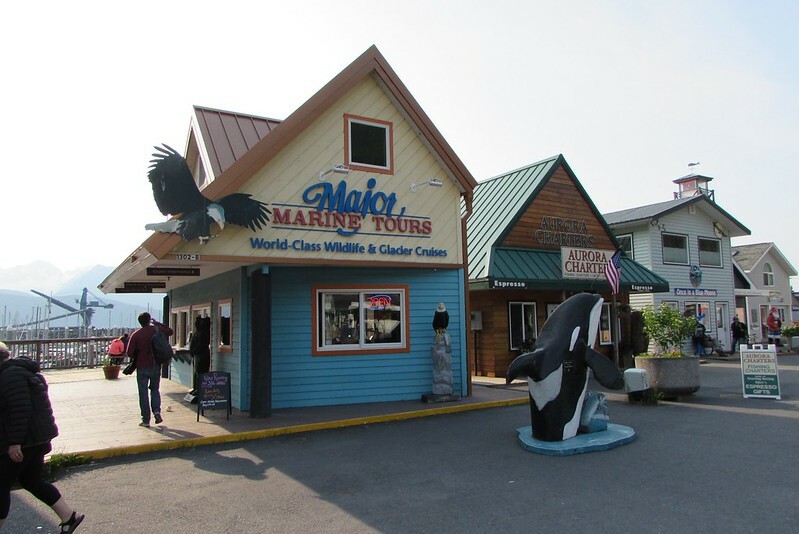 Without much ado, I was able to get our boarding passes at Major Marine Tours’ office. We were unsure where to park, though I recalled reading that MMT would refund the parking fee for the day. At this point, we had parked at a nearby two hour parking zone. The agent informed me that we needed to turn onto the main road, and make a left to park at the paid parking lot. They would reimburse us for the parking fee in the evening after the cruise. Shortly, it was time for us all to board. And here is my biggest peeve with MMT: on our first cruise from Whittier, we got the front seating in the boat (not that we stayed on the seat for the whole duration of the cruise). On the second cruise also, we got seats that were by the window though not in front. I didn’t ask, but I assumed that we got our seat assignment based on when we had purchased the tickets. 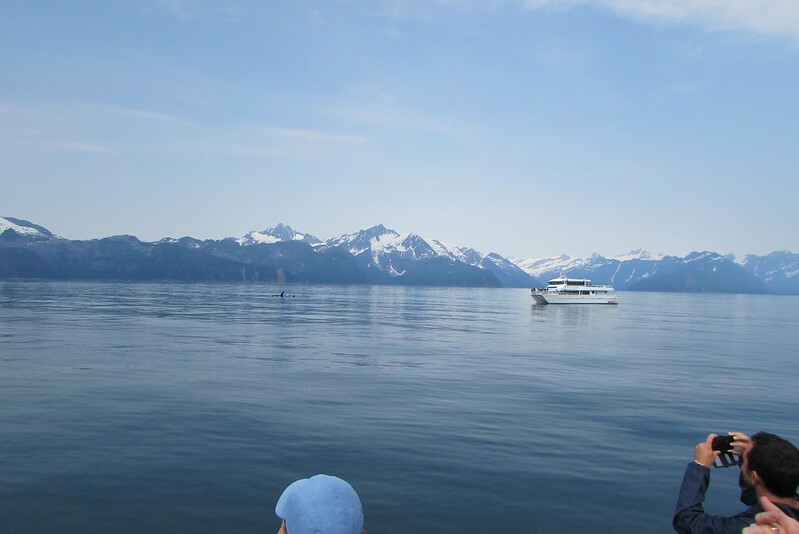 But on the cruise out of Seward, we got assigned a bench in the middle of the boat … on the UPPER deck! This would not have been an issue if we were travelling without my mother; and even that would not have been a problem had the restrooms and the coffee/tea been available on both decks. But no, for that one needed to come down then go back up. So, I asked the crew (Sean) if he could accommodate us on the lower deck, as my mother would’ve difficulty going up and down (one thing I had realized from the previous two days was that my mother would need to get tea – she preferred to get it herself to mix in the right amount of sugar and half-and-half – and use the restroom multiple times during the cruise). When Sean expressed his inability as the boat was full, we had no other option but to proceed up the stairs. As the passengers were not being informed which seat was reserved for them, I thought that he could’ve rearranged it such that we were on the lower deck and some other – fitter – party could’ve been moved to the upper deck. Be that as it may, I decided to hang around on the lower deck in case someone didn’t make it. As the boat almost filled up, I grabbed a spot on one of the cushioned seats by the windows that was still vacant. When I noticed that there were no more passengers waiting in line to be checked in by Sean, I approached him and asked him if we could have the seats I was sitting at. He said that we could (I was so glad!). I immediately rushed up the stairs and got everyone downstairs. That worked out perfectly. I thought that as I had bought our tickets so far in advance (March), we should have gotten the lower deck or at least, we should’ve been asked if we have a preference. Since returning home, though, I have realized that probably even purchasing in March might not have been sufficiently enough in advance to get prime seating locations (though I never got a firm answer as to how they determine their seat allotments). Soon, we were underway and immediately, I realized that the sea was much calmer than how it had been when we were at the Great Barrier Reef last year. This time, though, I was well prepared and had downed an anti-nausea pill. 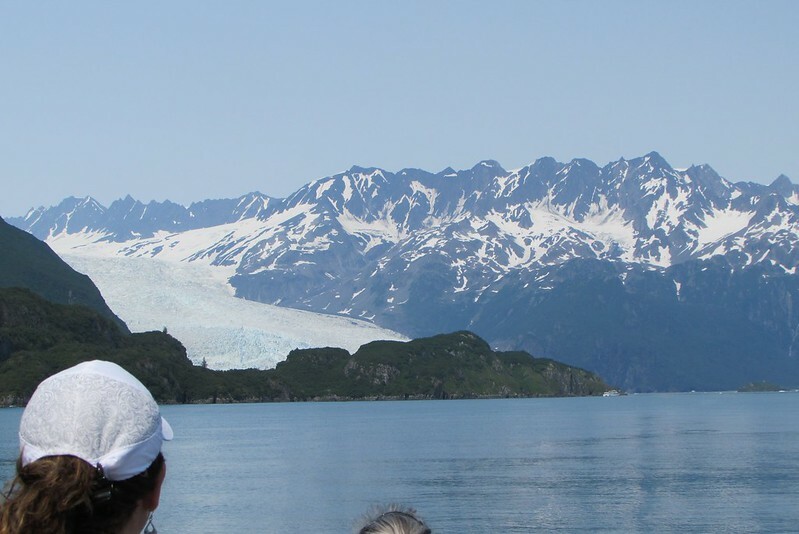 Soon, we were past the end of Seward town and in sight of our first glacier of the day. 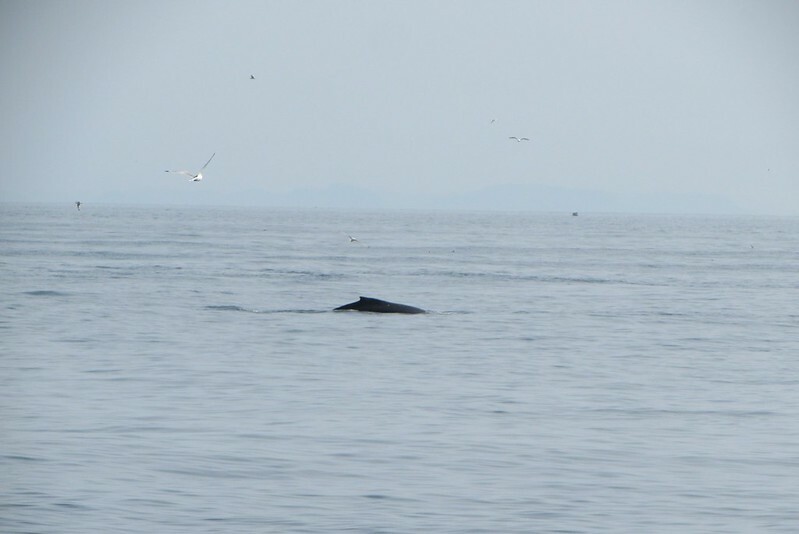 We then got in position for some humpback whale action. 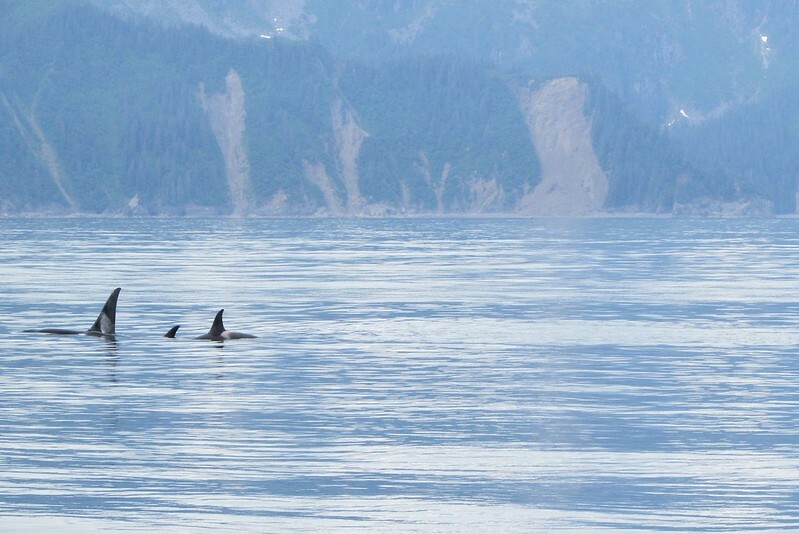 Our boat had been trailing the Kenai Fjord Cruise’s boat, which had already gotten closer to the animals. 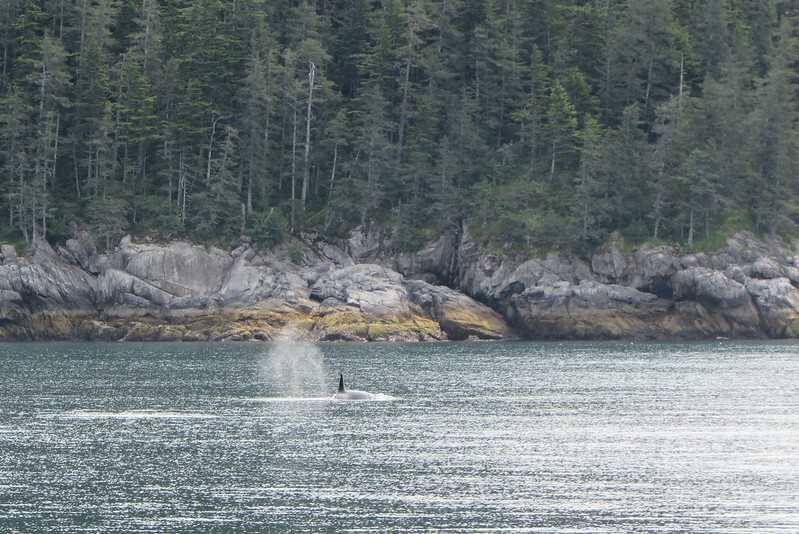 But we came on the scene shortly as well, and were able to see the whales in action with their blow spouts. Needless to say, I cannot tell one kind of whale/shark apart from the other – and depended on the ranger on board, who was doing a great job sharing information with all of the passengers. 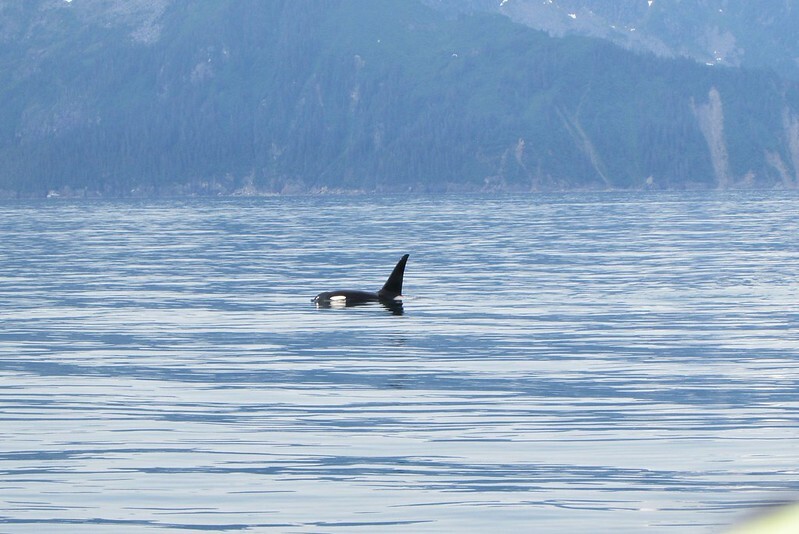 The Orcas I can identify and tell apart from the other – related or unrelated – species! 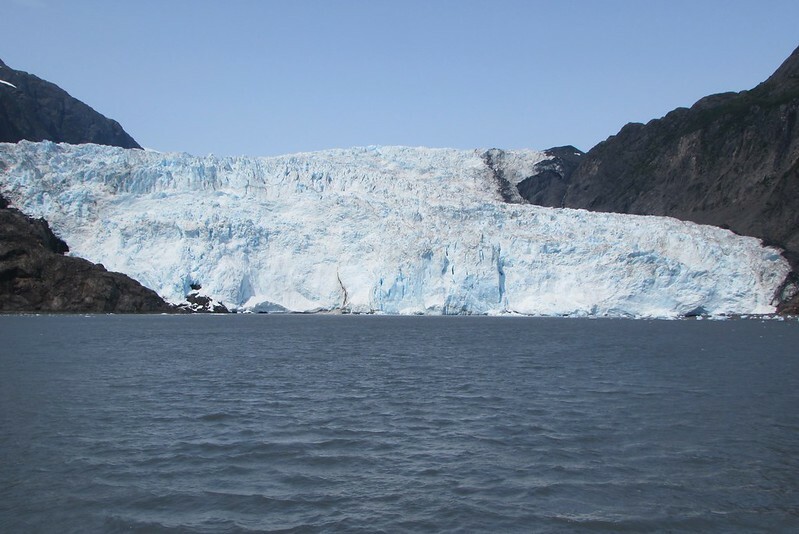 For the concluding part of the day, all I can say was that it was really nice to go so close to these two glaciers – Holgate and Aialik – and though neither of them calved significantly, just standing on the boat and staring at them at that distance was something! 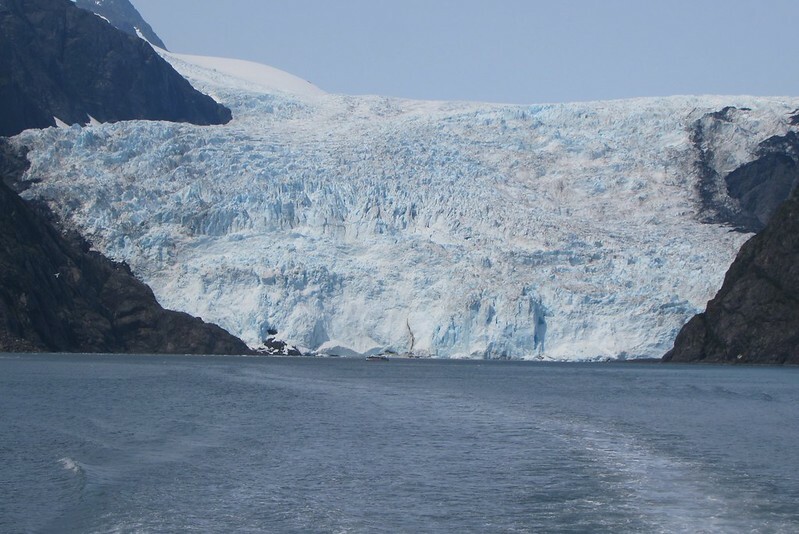 One cannot get a sense of how monstrous these glaciers are when you are on the boat heading toward them – or after the boat has made its closest approach and is in a holding/circling pattern so everybody can get their photos. 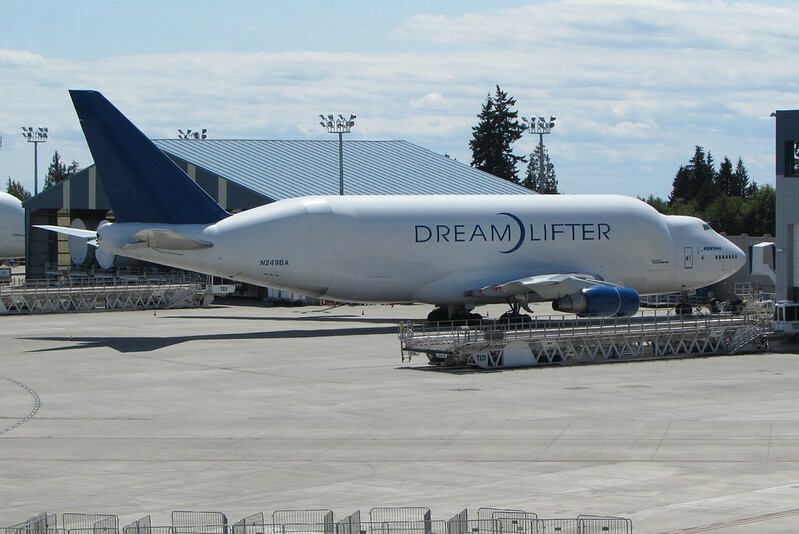 Unless I’m on one – that did not happen on this trip – I don’t think I can comprehend the size of one of those. There were many micro icebergs floating all around is as we went close to the glaciers. Just like on the previous two cruises, crew members harnessed a chunk of ice and made drinks out of them for the passengers. 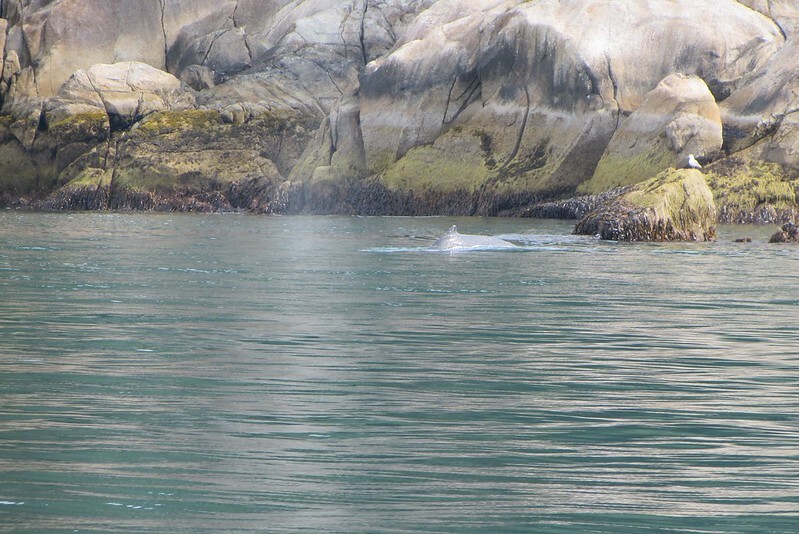 As we approached Aialik Glacier, we saw many kayaks on the water right below the sleeping grizzly. Oblivious of the action around him, he continued snoozing. On our way back from the glacier though, he had decided that enough was enough, woken up and wandered off back into the woods by the glacier. 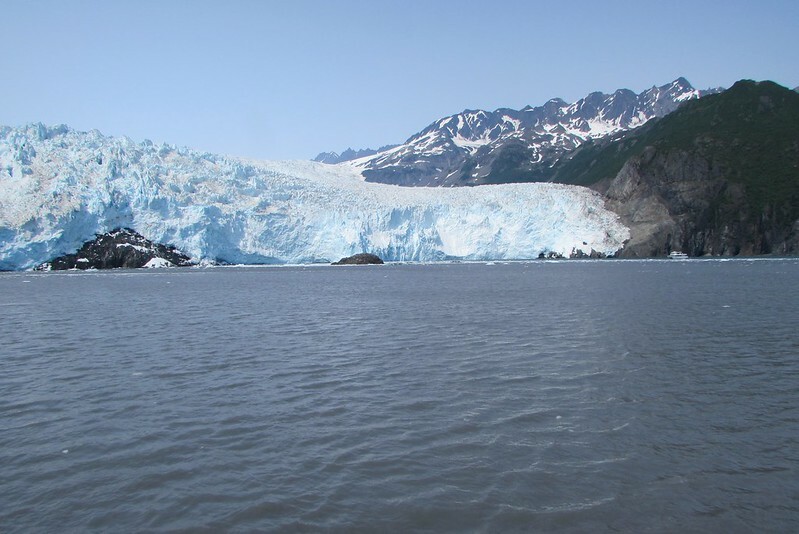 However, one thing that was really surprising and which stood out to us was that on the approach to each of these glaciers, we felt a draft of warm air. Where I thought we would be feeling the coldest, it turned out that it was the warmest feeling we had on the boat. I didn’t get a satisfactory explanation from the crew or from the ranger. Anyone here? 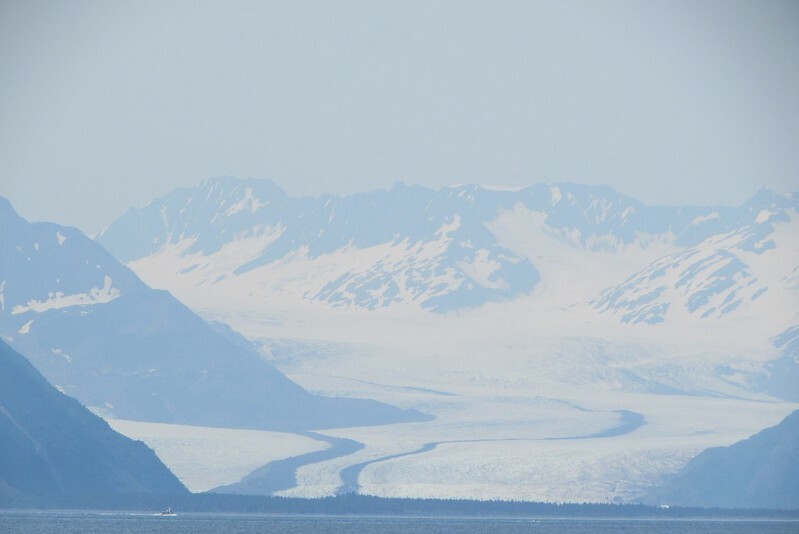 On the way back, once again we passed Bear Glacier with its huge moraines where three (or more) glaciers joined together to form it. Once we were back on land at about 5:30 pm, Baab and I noticed that some folks were being rushed off for their train journey. 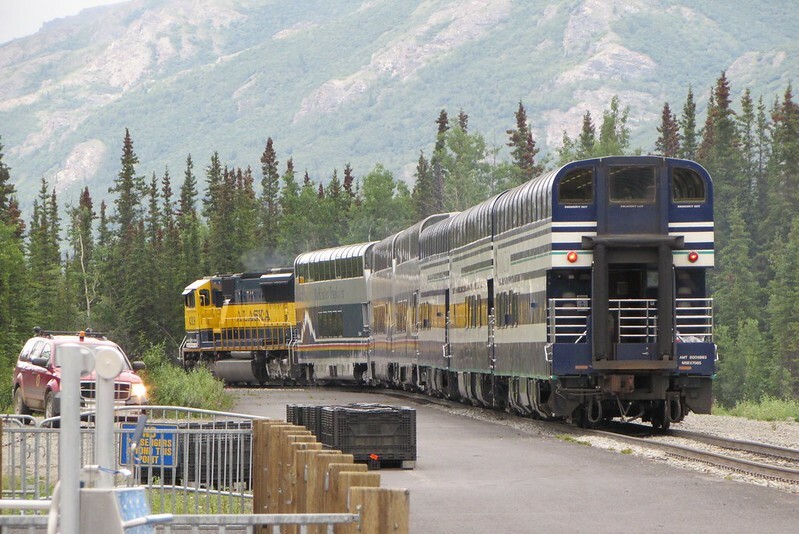 Upon enquiring, we were informed that the train to Seward comes in in the morning and stays there the whole day, returning only at about 6:00 pm. So, some of the folks on the boat needed to get to the train quickly. 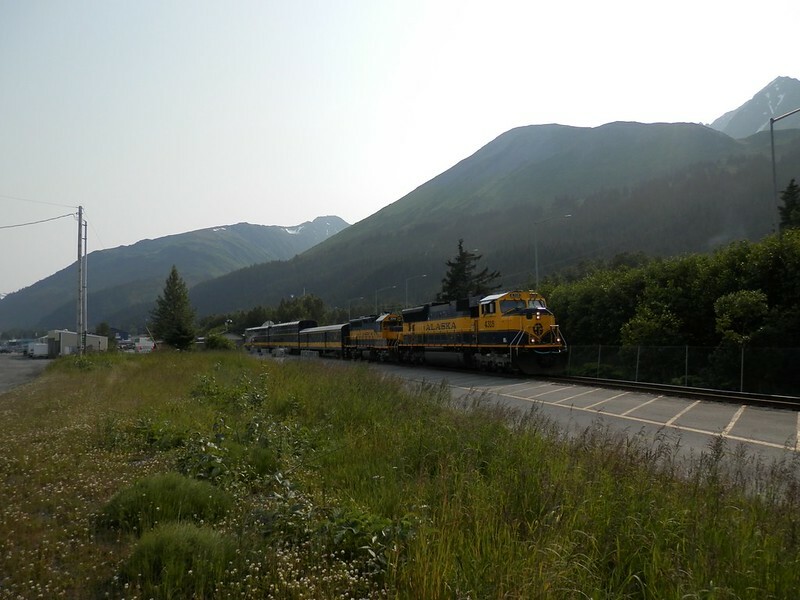 We were glad that we didn’t have to leave just yet; besides, Baab and I thought that it would be nice to take some photos of the train departed Seward. So, we quickly hurried over – which, in retrospect, we didn’t have to because the railway station was not too far away – and found an ideal location to take photos and video. After the train had left, we wandered back into town and spent some time at the Kenai Fjords National Park Visitor center where we got some souvenirs; Mrs. Porcupyn and Katya went over to a couple of other shops for more curios. At this point, we had ticked off everything that I had planned to do. I had wanted to go to the Exit Glacier for a hike, but was not interested in paying $100 (or thereabouts) per person to get a guided experience up to the Harding Icefield. 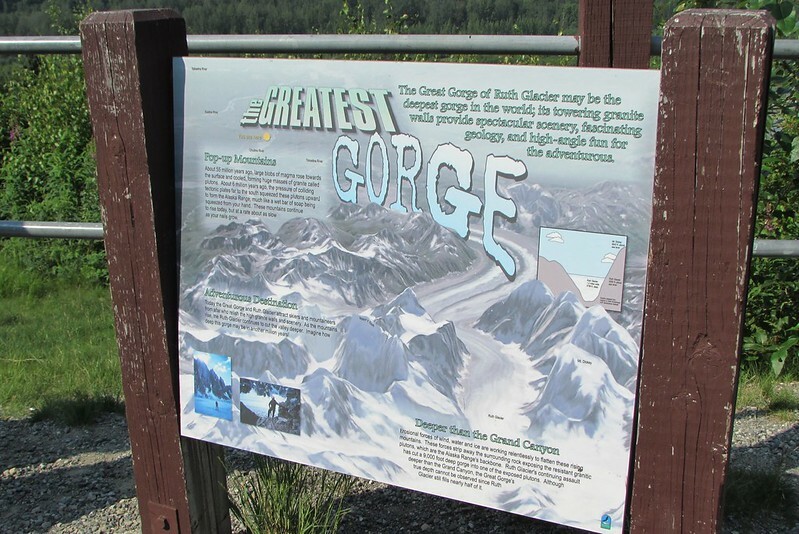 At the place where we got souvenirs, the staff informed us that there was a ranger-led hike that departs the Exit Glacier visitor center at (IIRC) 10 am and goes up quite close to the glacier though you still cannot walk up and touch it. As this was something that would not be too strenuous and would only take about 90 minutes round-trip, we decided that all of us would go on it tomorrow, except my mother who we would leave in Cooper Landing until we returned right around lunch time. The plan for today was for DD and my mother to stay at the Talkeetna cabin and relax for the day. The Wifi and smartphone combination was enough for DD and my mother was OK to sit and read whatever info material we had collected around Alaska thus far. 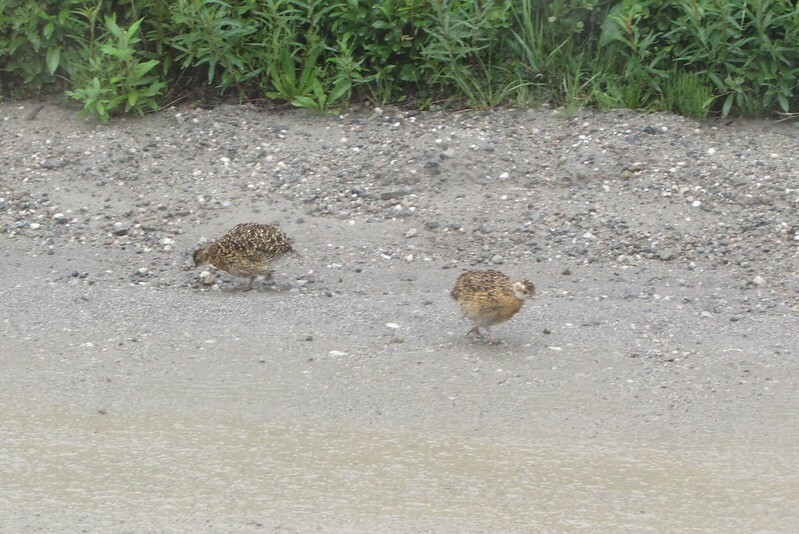 As for Mrs. Porcupyn, Baab and me, we planned to go upto Eielson and check out the visitor information movies and also hoped to spot some wildlife as well. When I went up to the office clubhouse to get some coffee, I learned from the staff that the office would have a bonfire going at seven pm that would last through ten pm if guests were interested in hanging out. The impression I got was that if guests were not out there, it might die down quicker than that. So, I thought that it might be a good idea for us to return by about eight pm so we could take Katya and my mother to the bonfire. But as we really did not have a set plan (the Eielson visit was still a bit loosy goosy), we all lazed about more than we should have. The result of that was that we were a bit later there than our scheduled time. Now, per the website, it is difficult to accommodate you once you miss your scheduled; however, our actual experience was that they try their best to accommodate you. In our case, we were able to get into the next available shuttle to Eielson. The problem now was that it was right after noon. A quick calculation showed that if we were to go all the way, the earliest we could expect to be back here was 8:30 pm, which would put in Talkeetna at 10:30 pm! Needless to say, we revised our plan for the day (so, what’s new?!). 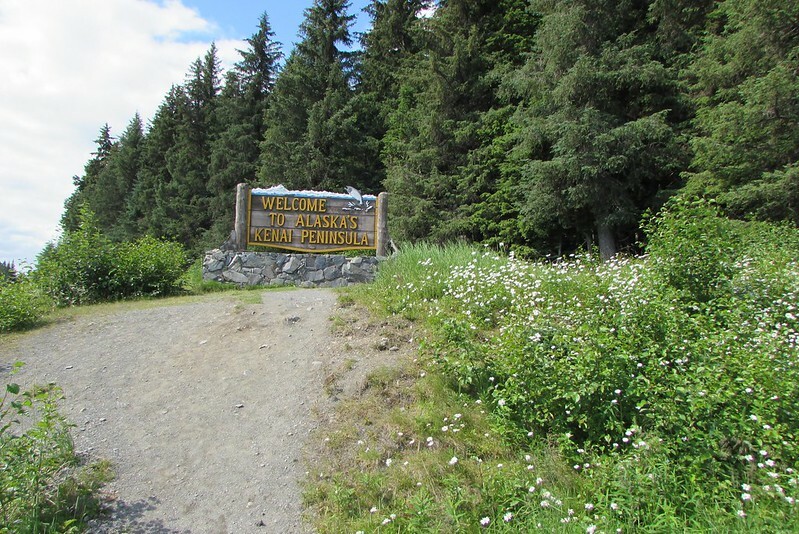 Now, we would just go up to Teklanika and return, hoping that we would be able to a) see some wildlife by then and b) catch a quick return shuttle. To be honest, I was also a bit intimidated by the slopes of the mountainside where the park road is cut into, and I felt that the bus drivers (especially on the return trip) hug the edge too closely. So, I was not too miffed at missing out on Eielson (though we could’ve stuck to the itinerary and informed Katya and my mother that we would be late returning to the cabin, and gone all the way there). Also, the quick return would give us a chance to watch the entire dog sled presentation too. 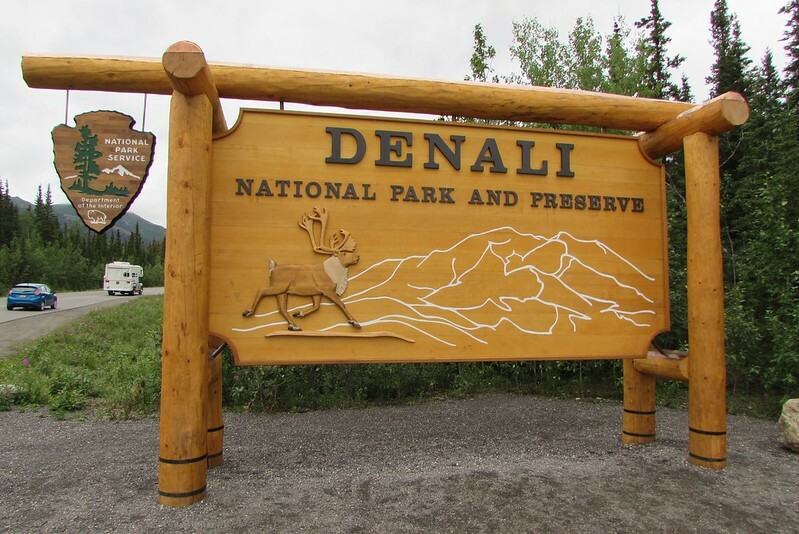 Moreover, we would be able to visit the post office and mail ourselves some souvenir cards stamped at Denali! 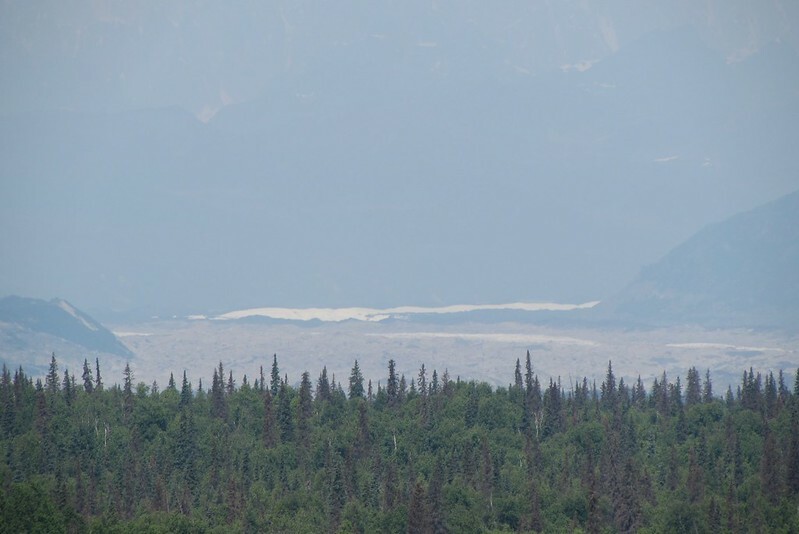 Like yesterday, the day was not too bright and we did not expect to be seeing Denali. When we got onto the shuttle, we informed our driver that we would like to be dropped off at Teklanika and we would catch the first available shuttle that was returning. In about an ninety minutes, we were at Teklanika. By now, I had remembered that I had left my sweater in the car, as this was the coldest of the three days we were at Denali! Hello Murphy!! Back I went to talk to the driver, asking him if we could stay in the bus and he could ask the nest returning bus driver – as we were about to cross – if there was space for us. He didn’t have an issue with that, though he said that we might not be able to return on the first bus we encountered. We were OK with that, because the situation would’ve been the same even if he were to leave us at Teklanika. In any event, as we were about to get to the bridge at Teklanika, we saw a bus coming in the other direction who had space for us. 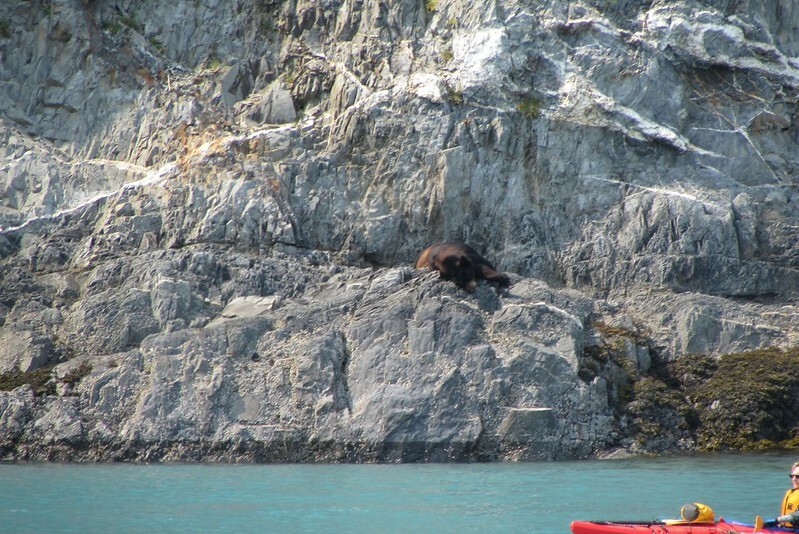 The minute we climbed on, the other passengers said, “So, you didn’t want to see the bears, eh?” It was just our luck on that day – those folks had seen a sow and her kiddos not five minutes past that point. 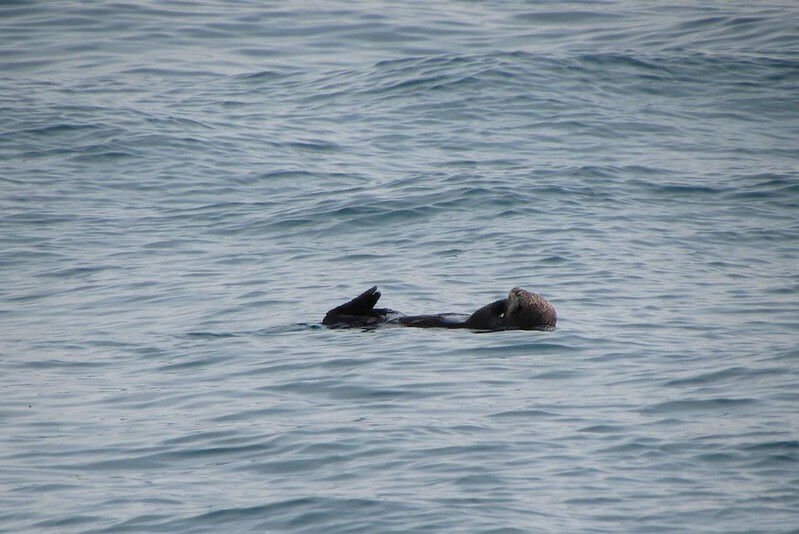 Had we stayed on our shuttle, we might have right now been seeing them! Bah, humbug, we said, and took our seats. I forgot to say one thing – our bus drivers for the day were the least vocal of the ones we encountered. In fact, the bus drivers’ communication about the parks kept going down on each bus – Courteous Ken from Kentucky was the best, then it was T.P., followed by the two drivers of today. They had not received the gift of the gab! We were near the dog kennels and it was not yet even three pm. The driver asked if anyone would like to be dropped off here. I said sure, we would. But just as we were about to get down, I remembered my missing sweater. So, I asked Baab and Mrs. Porcupyn to get down but I would stay on the bus, so I could go and get the car and return here with it. And so it was that we got to watch the dog show. When we told her about it a couple of weeks after we returned, Katya was not too happy to know about that. The dog show was underwhelming, though Mrs. Porcupyn said that she did not expect to have seen much more than she did. But it was a fun experience nevertheless. Once we were done with the dog show, we drove to the Visitor Center as we had not been inside even once (we had stopped by the first evening when it was pouring, but the Center had closed for the day by then). Soon, we heard the whistle of a train. Baab and I came out and realized that the train station was just a short walk away. Mrs. Porcupyn not being interested, Baab and I walked over for some more railfanning. 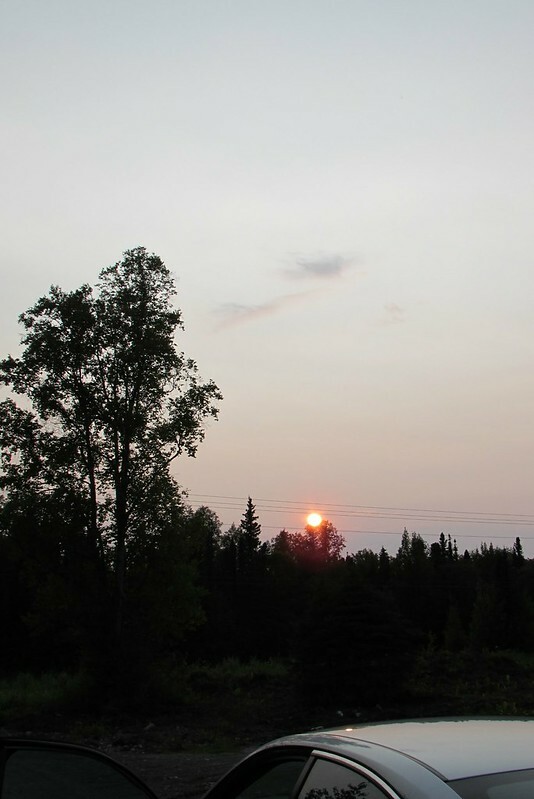 Alaskan summer sun at ten pm!! By the time we then returned to the cabin, it was past eight pm, and we then visited the office to check out the books they had (there were a lot of Alaska related books that I had never seen in the libraries or bookstores here). The bonfire was a bit of a letdown, and – hindsight being 20/20 – we probably would have been better off going to Eielson and returning later than ten pm. Oh well! So ends our visit to the Denali area. Tomorrow, we head for our final (and longest) base in Alaska at Cooper Landing!